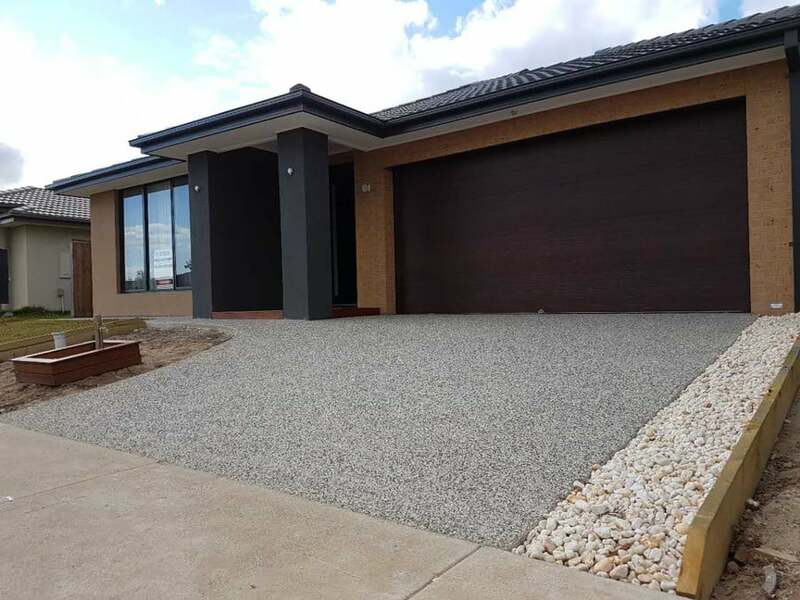 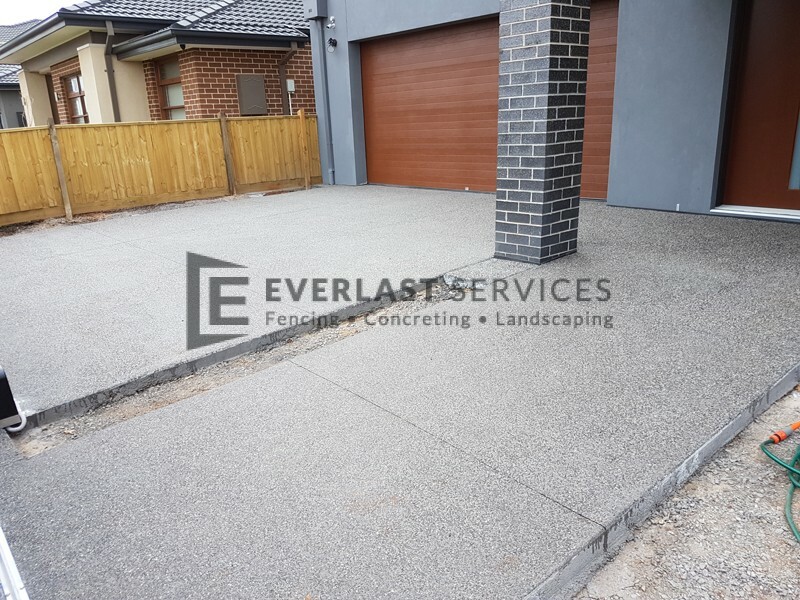 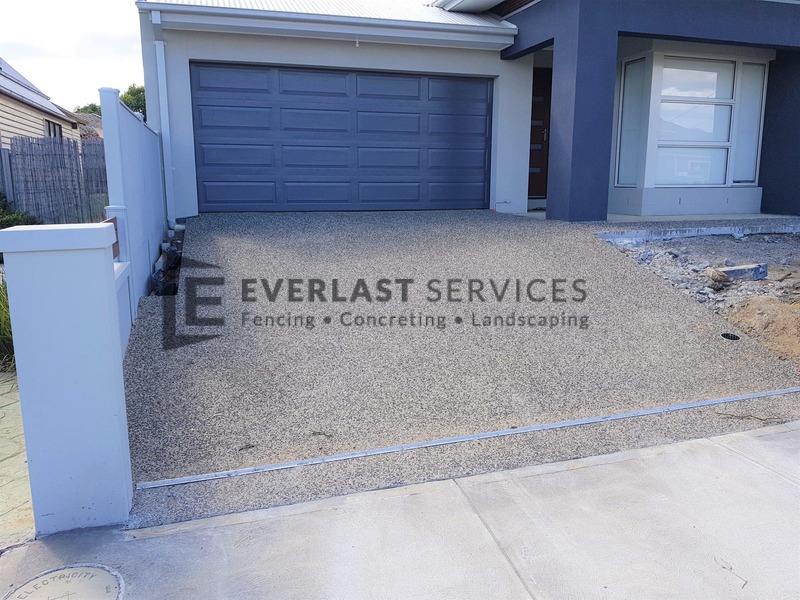 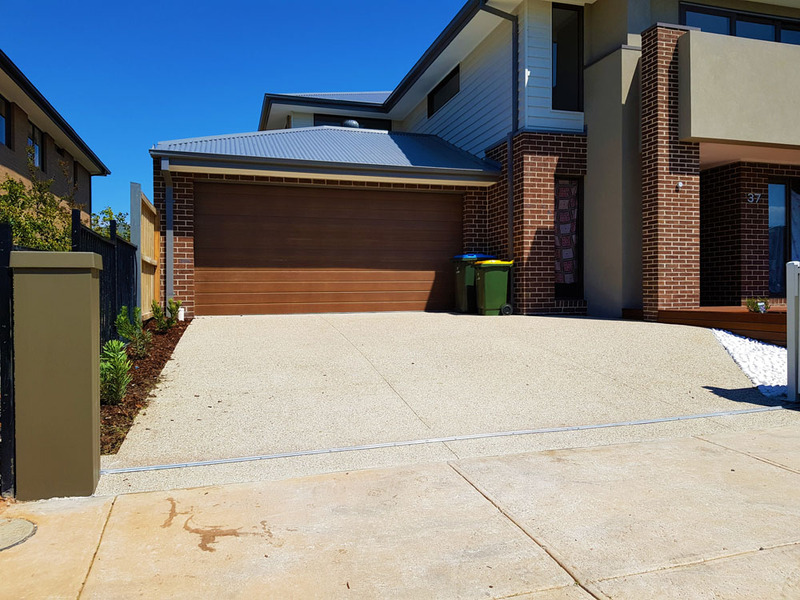 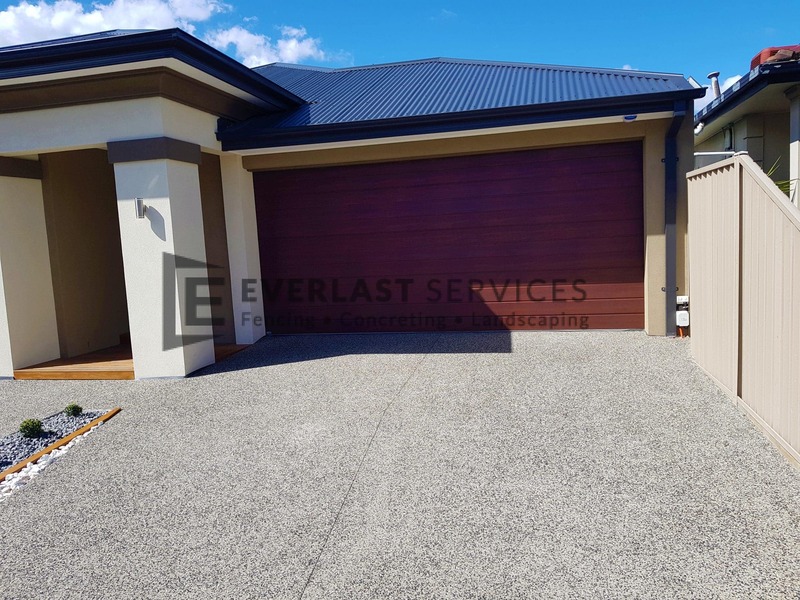 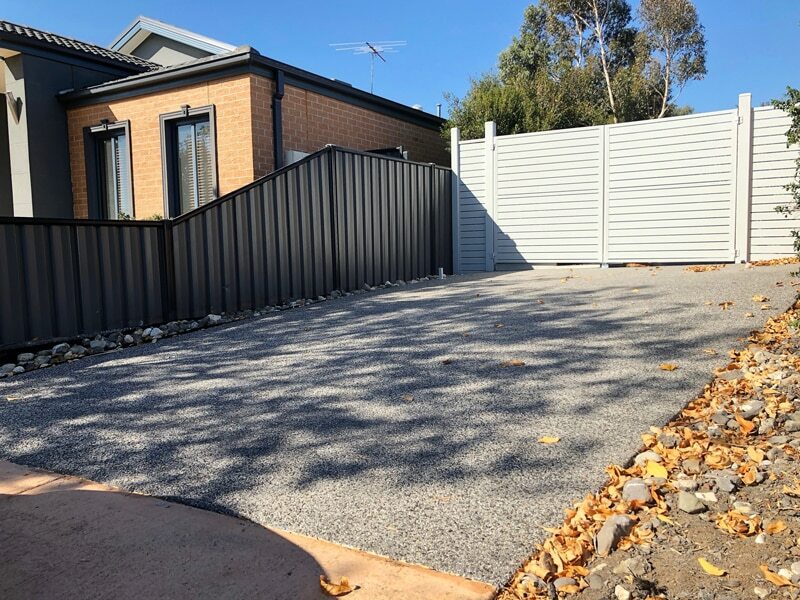 Cement is the best choice when it comes to selecting a driveway for your home, but if you want to add a spectacular visual element, then you can’t go wrong with exposed aggregate concrete. 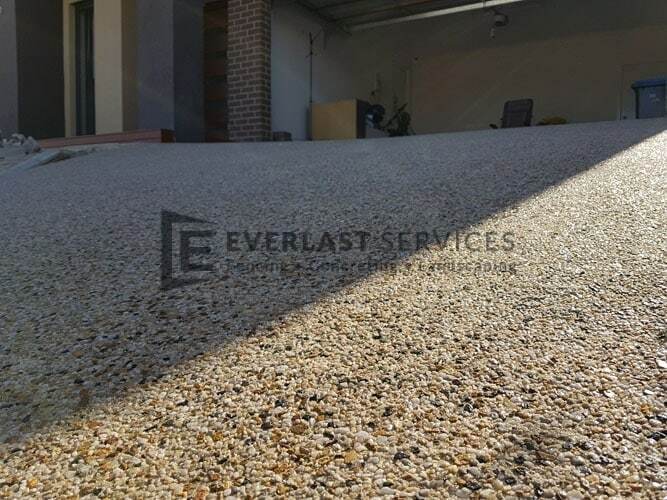 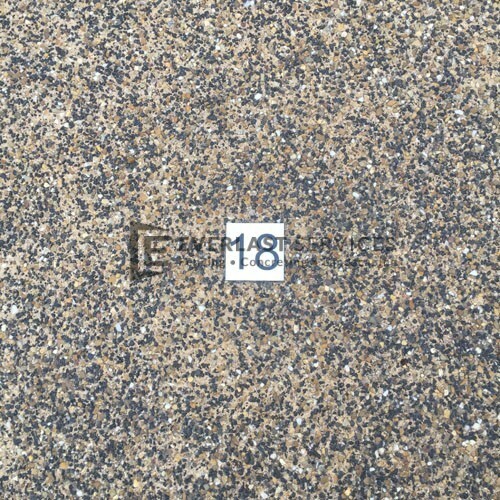 This product is also perfect for outdoor areas, especially around pools due to its non-slip properties. 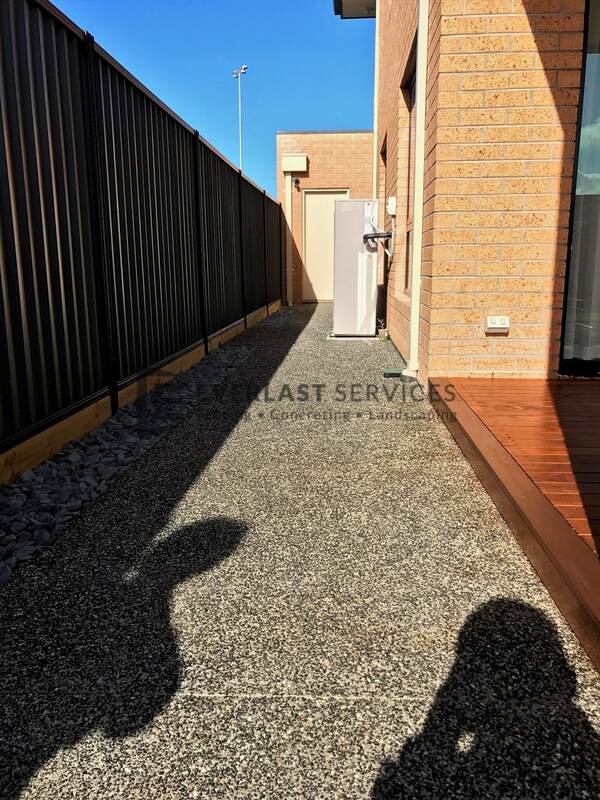 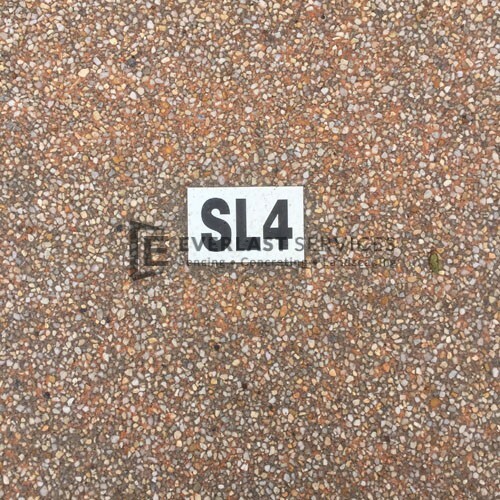 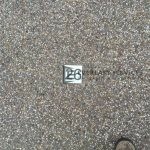 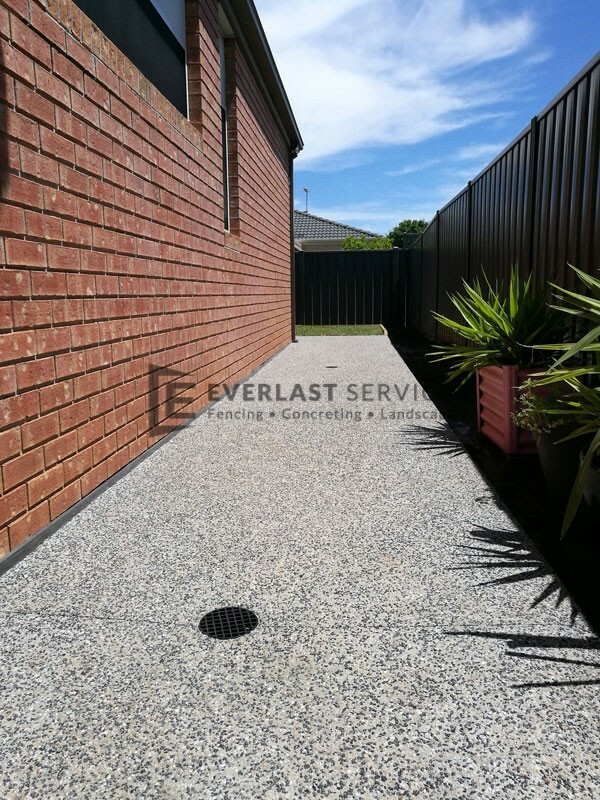 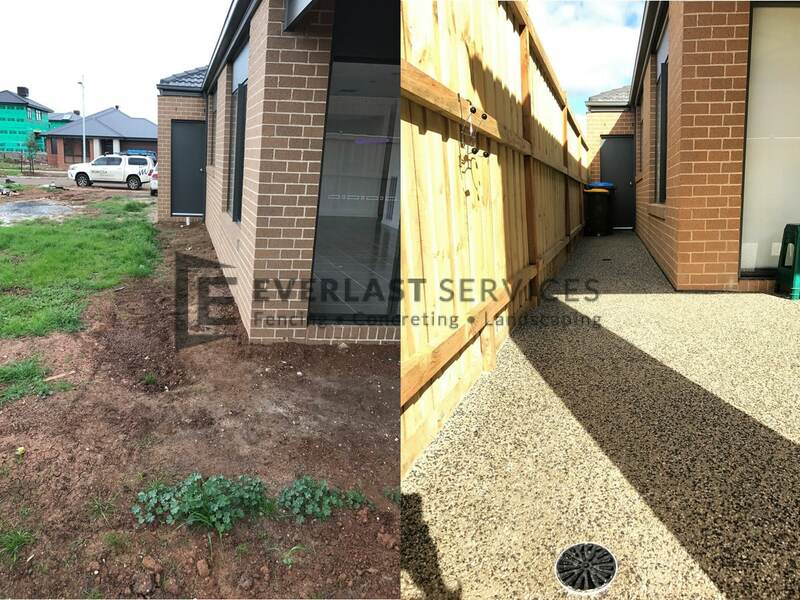 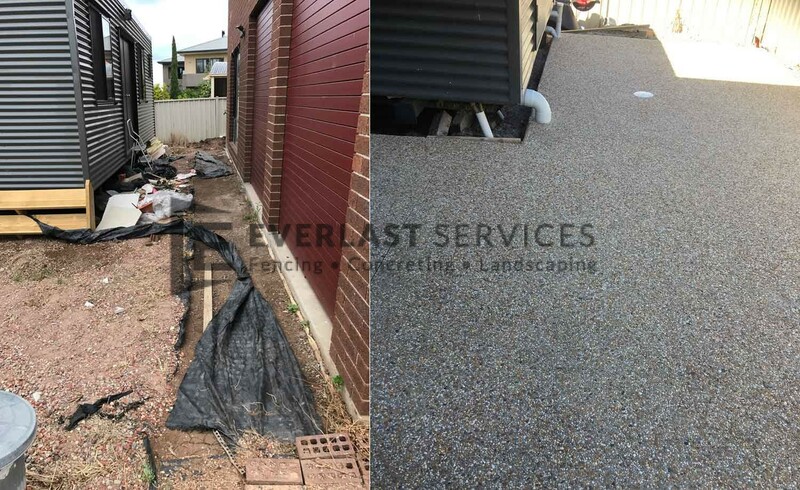 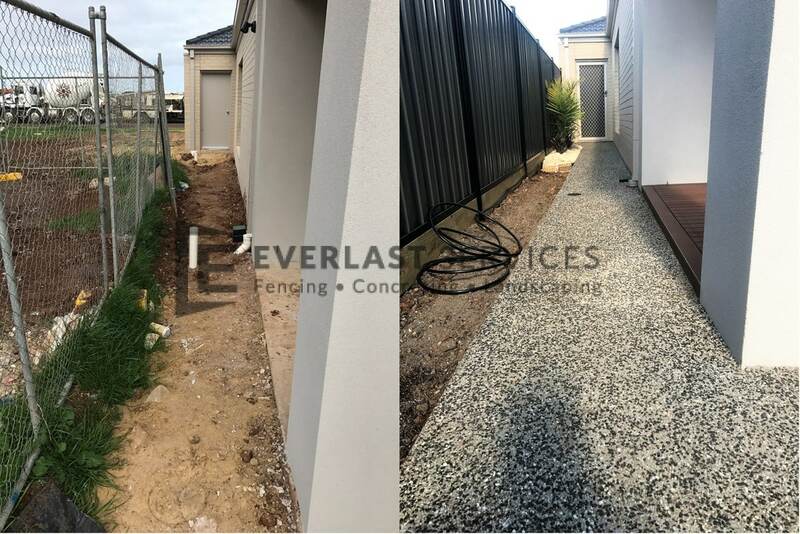 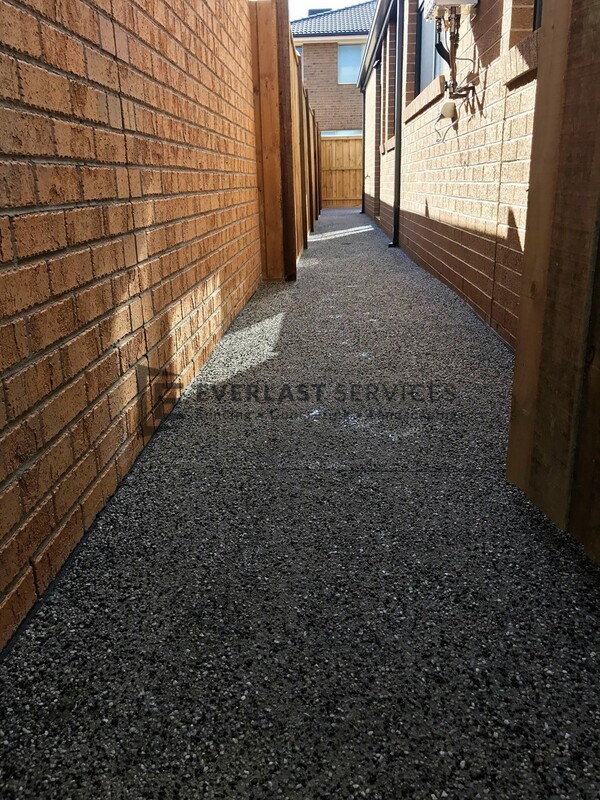 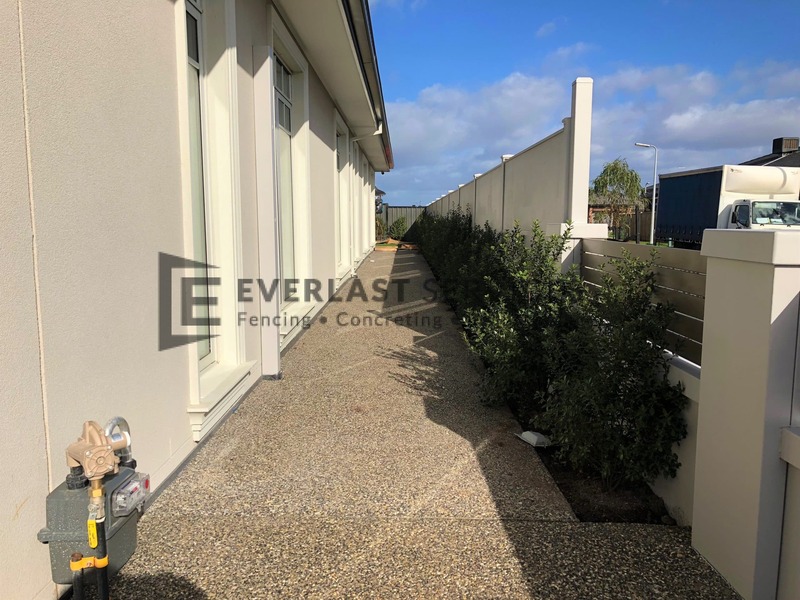 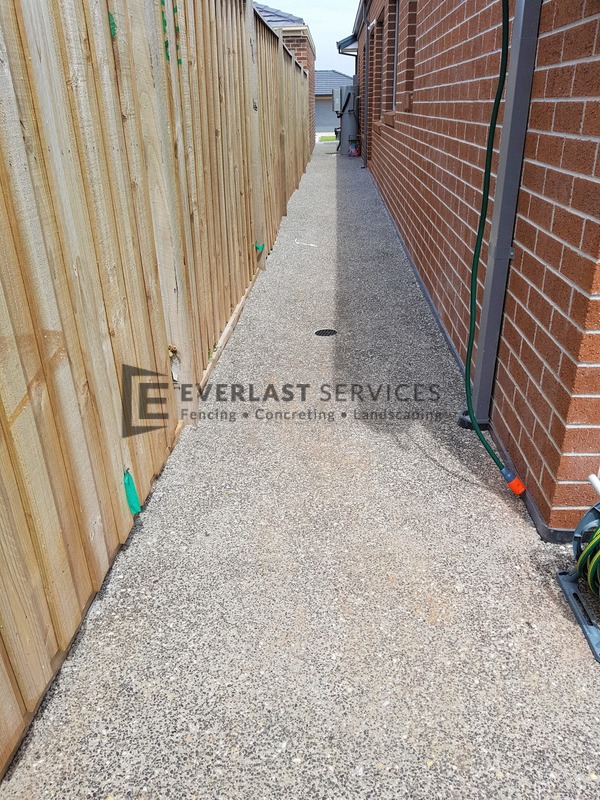 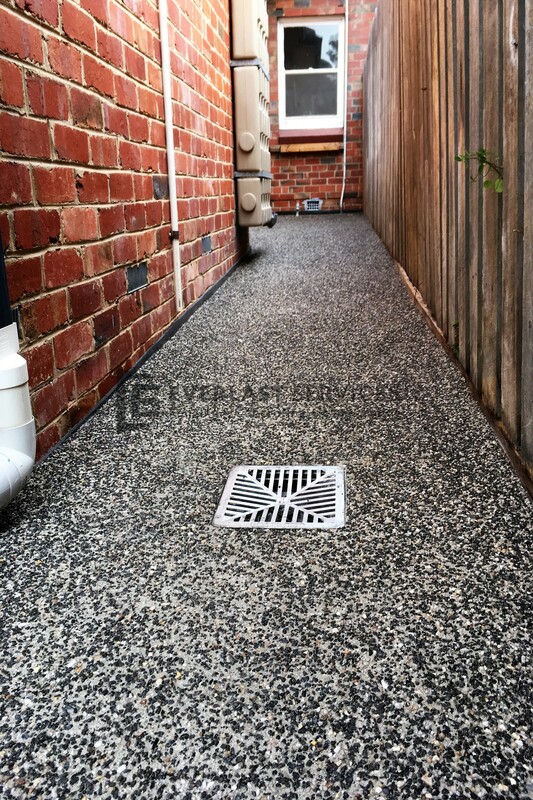 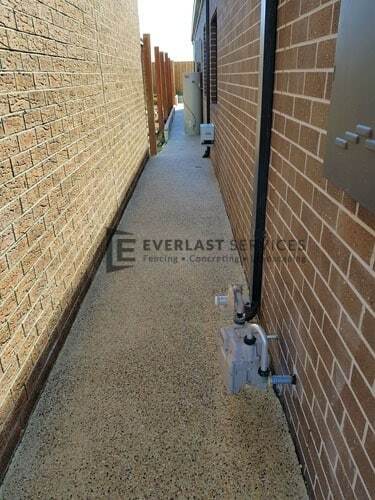 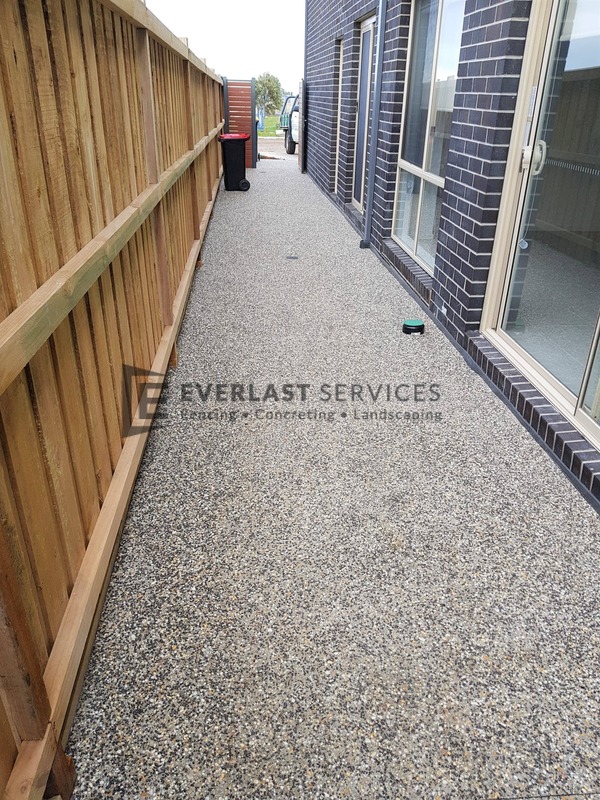 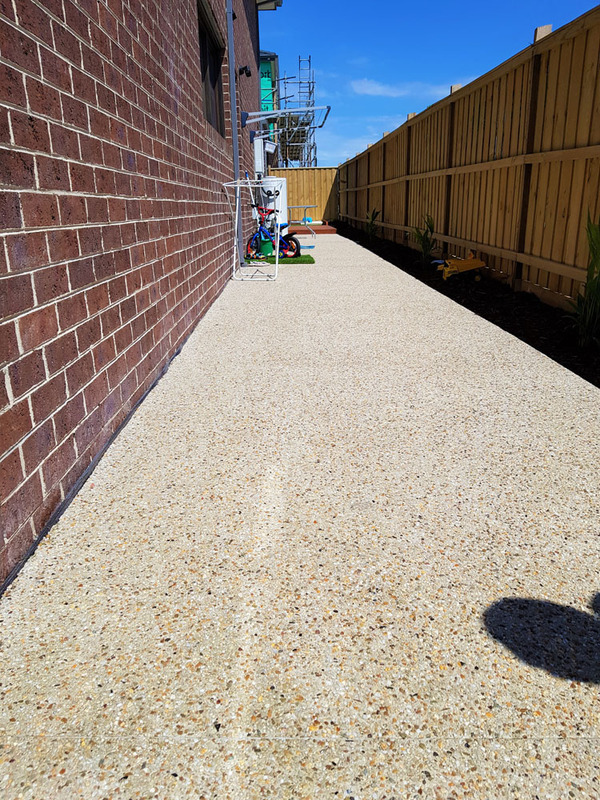 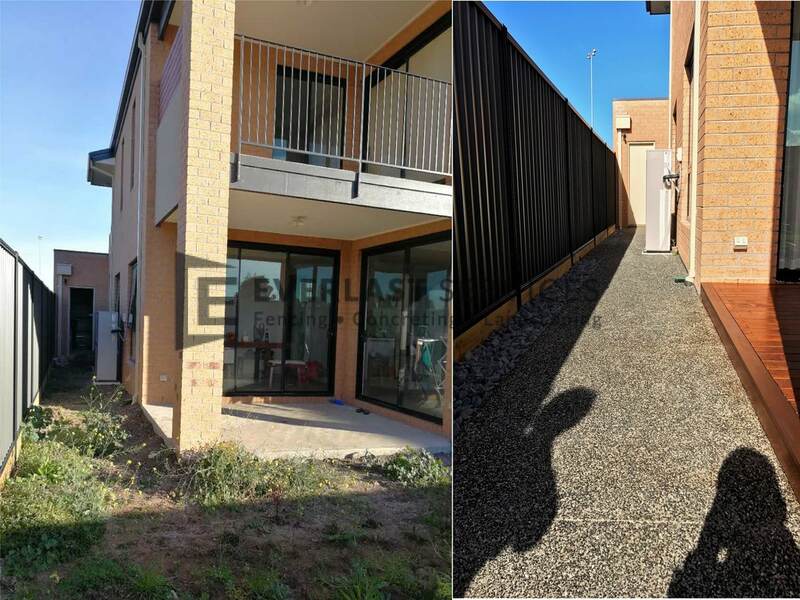 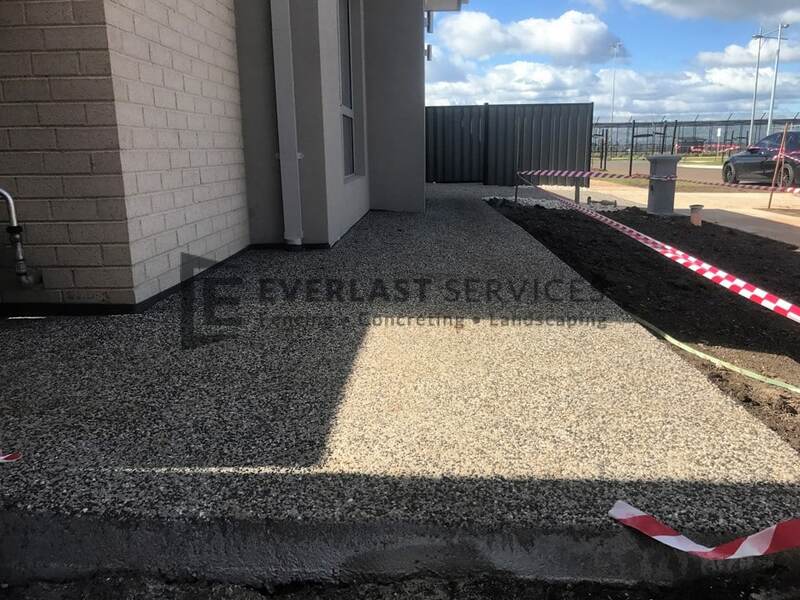 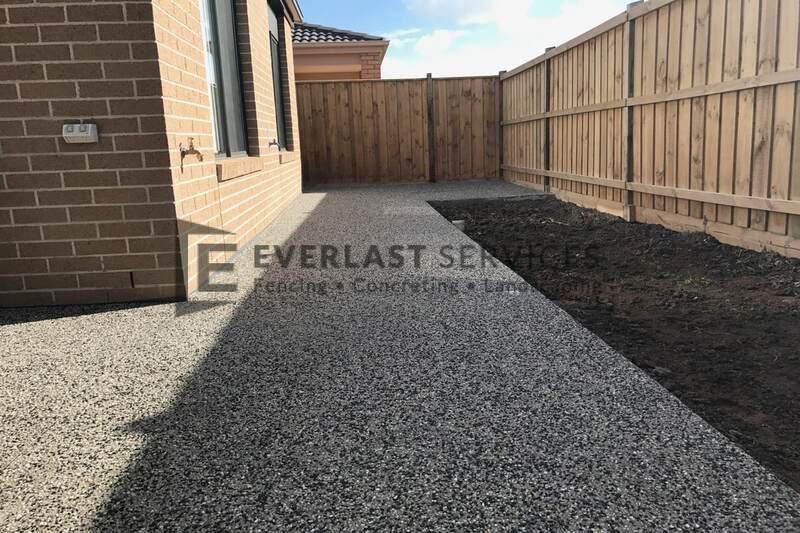 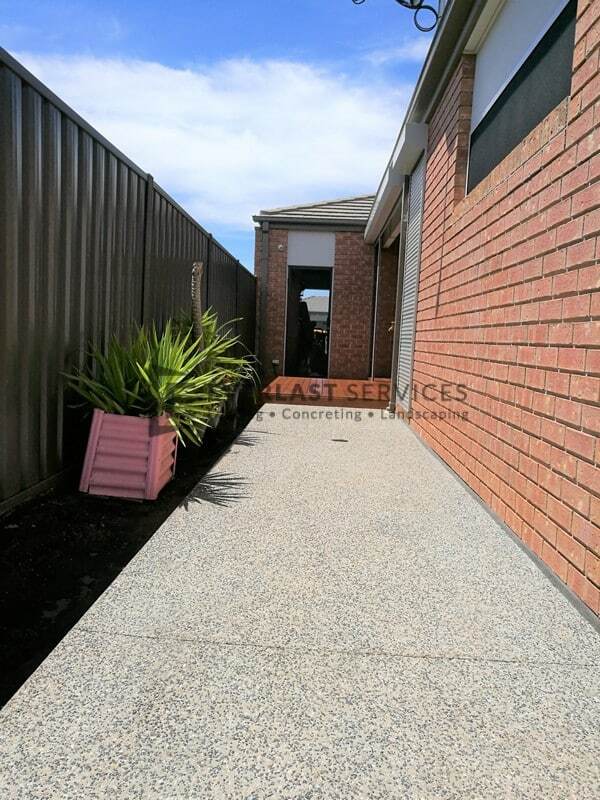 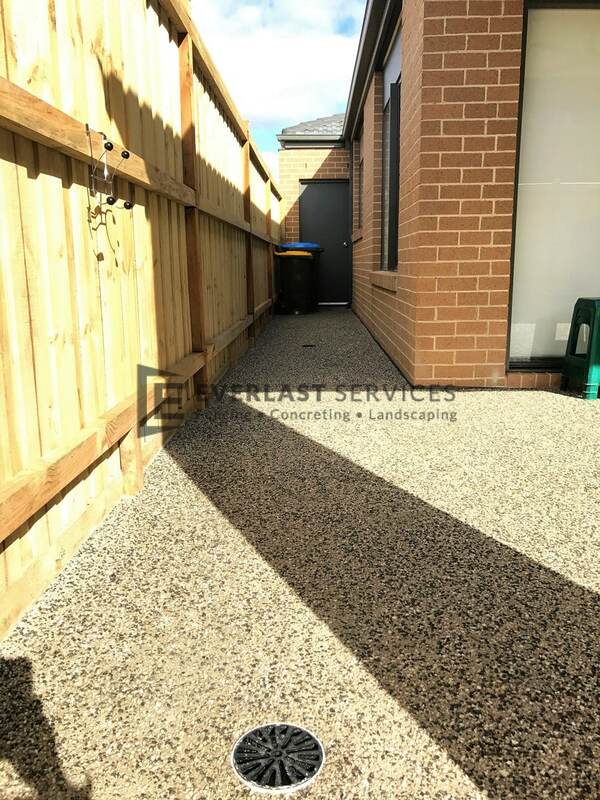 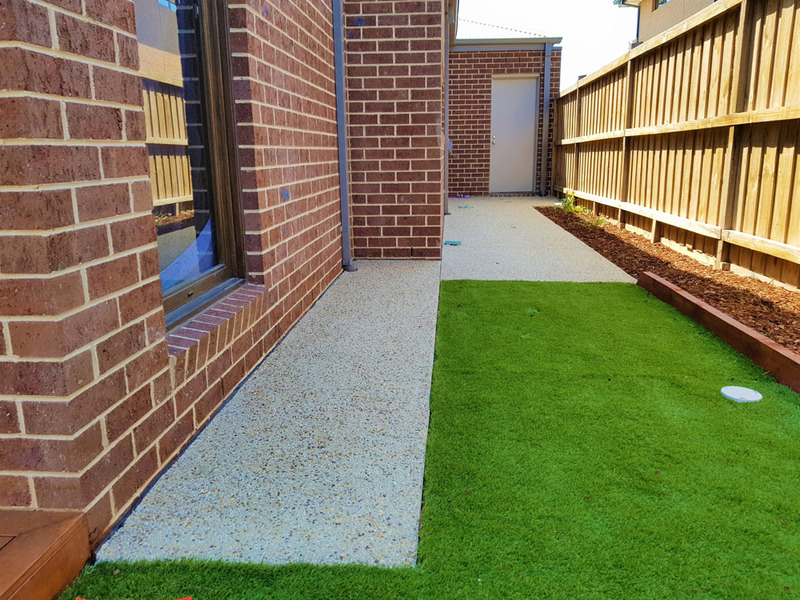 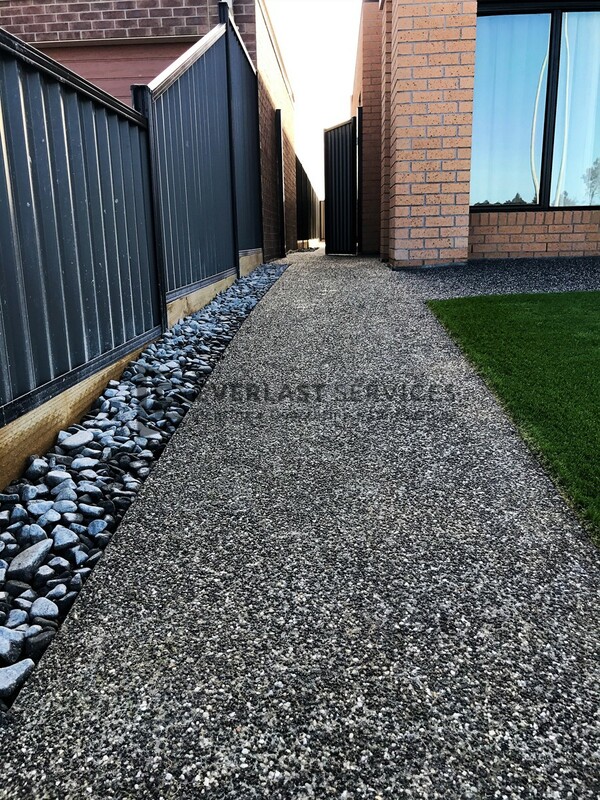 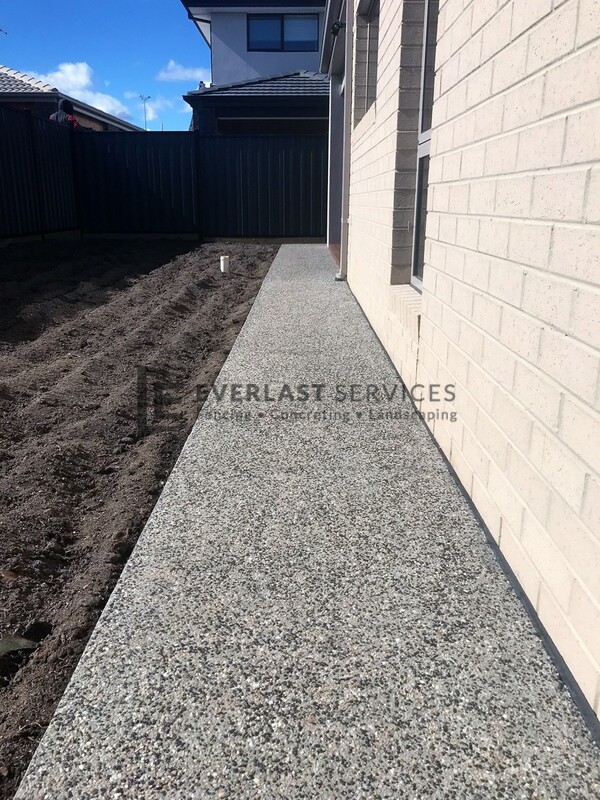 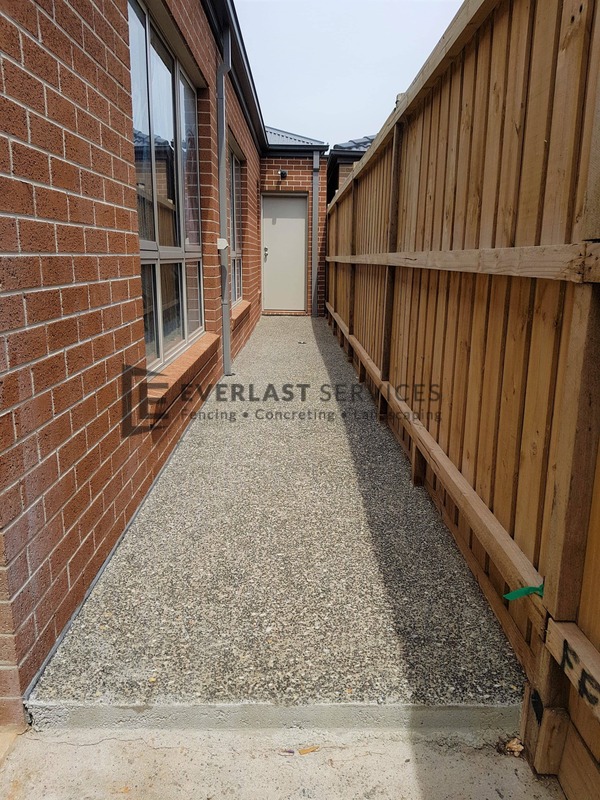 Our friendly, reliable tradesmen are highly experienced in this type of concreting work, which means that their job will last for years into the future before it even so much as needs another sealing. 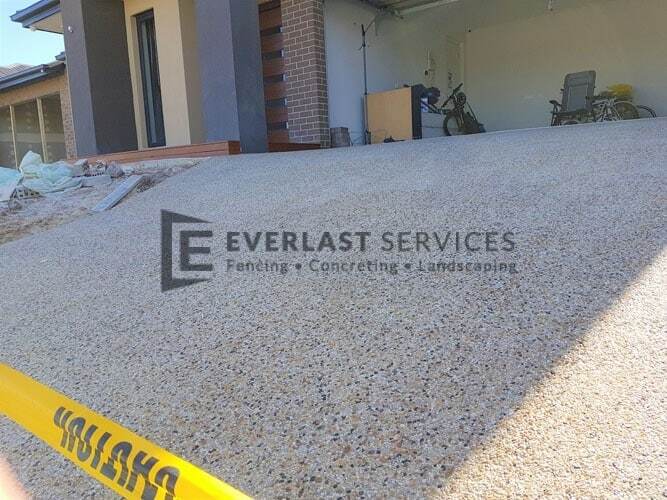 We take care of everything from the initial pour to the final blasting and clean up, delivering you a stress-free experience every time. 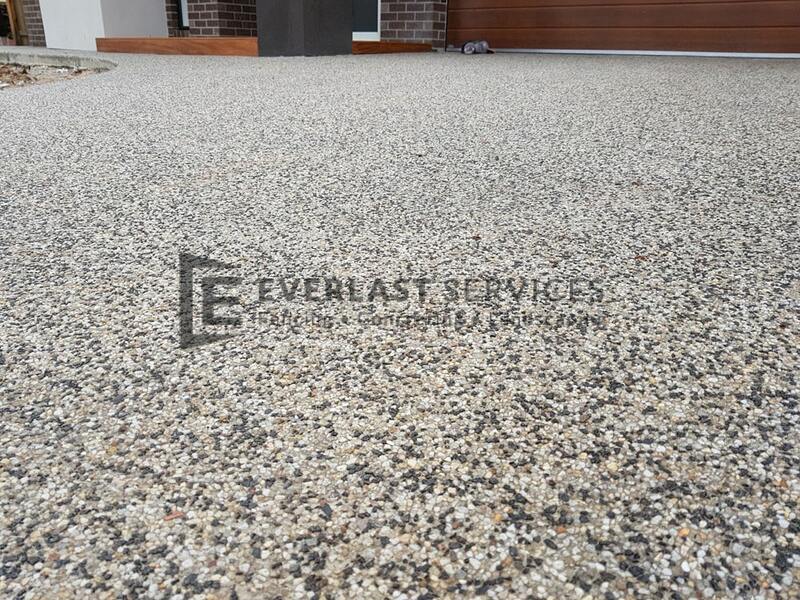 Durability with a stylish finish: You get all the durability and toughness of cement with a stylish, modern finish. 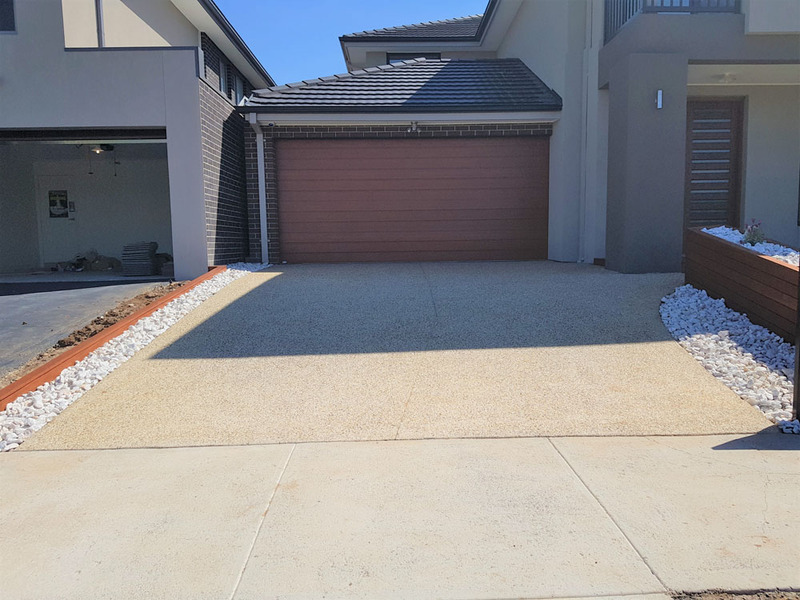 Concrete aggregate is perfect for high-traffic areas such as driveways and can be an attractive, value-adding element to your home. 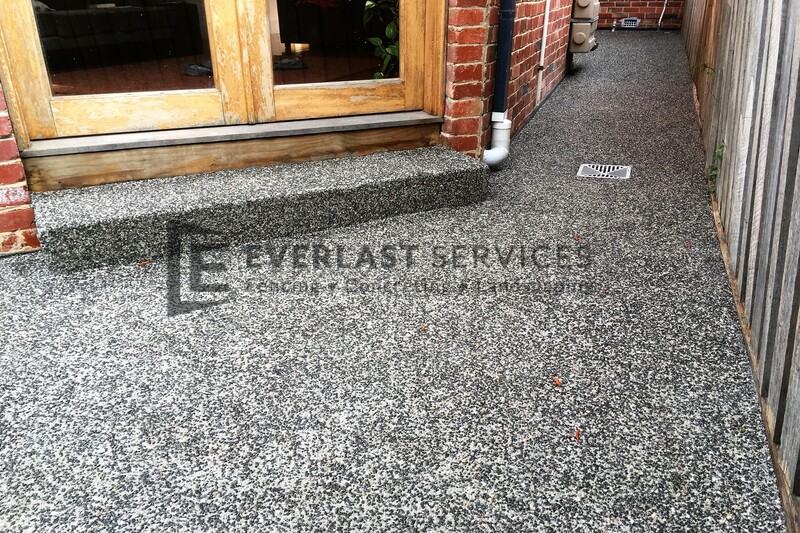 Weather damage is never an issue: You don’t have to worry about weather damage. 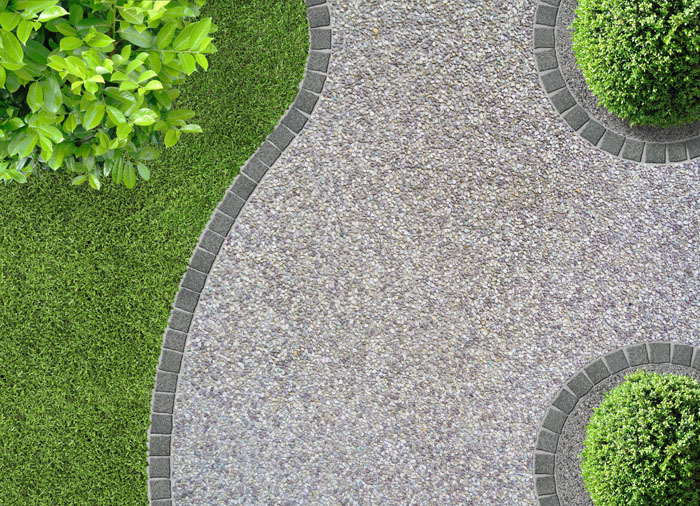 It can handle all the heat, hail, wind and rain that mother nature throws at it and still look perfect. 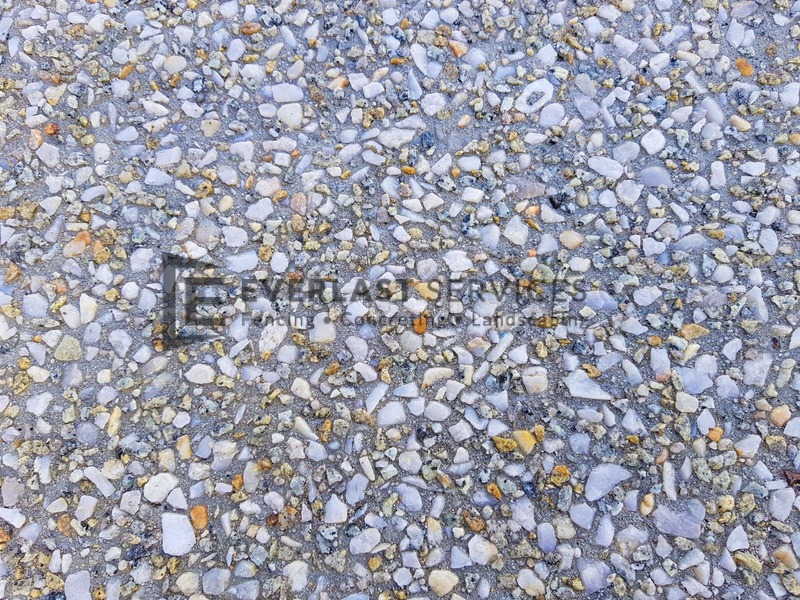 The options are endless: There are an enormous array of exposed aggregate concrete colours and textures. 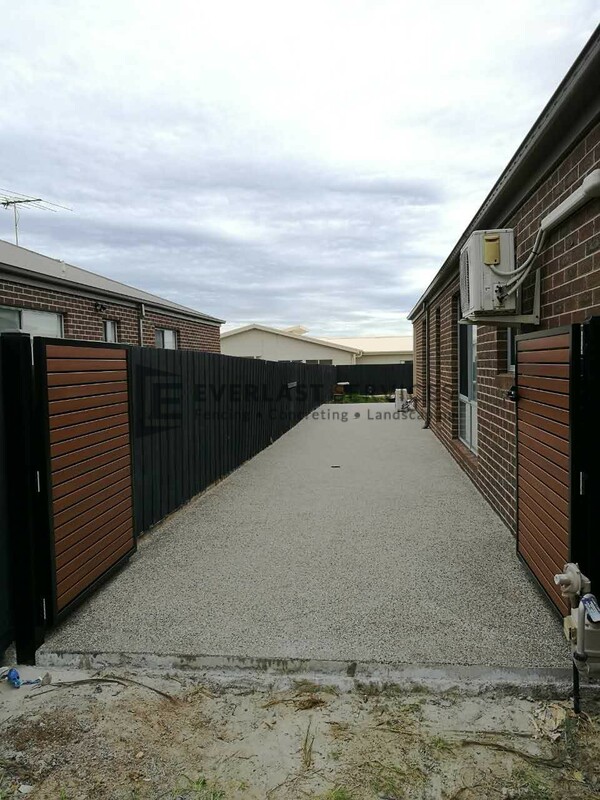 As such, this product always contrasts perfectly with all styles of housing – red brick, render, weatherboard, modern or heritage. 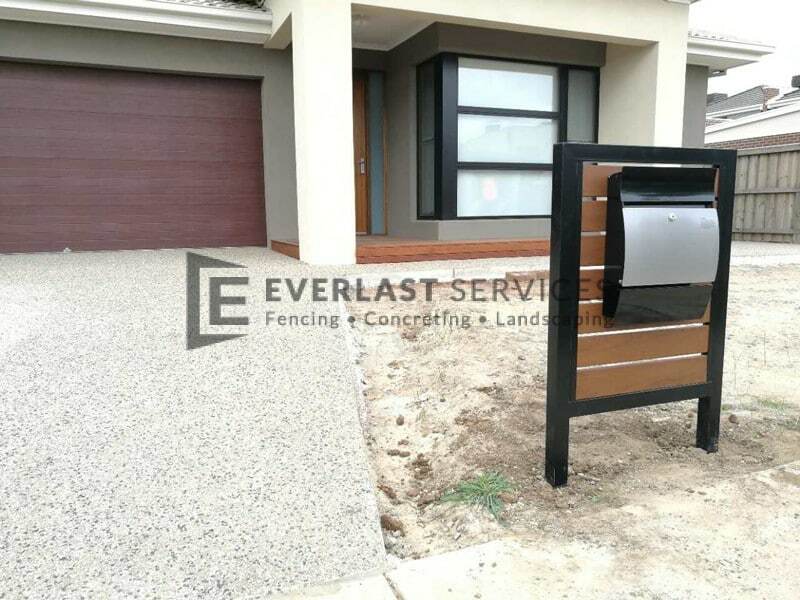 It is always that perfect combination of functional and stylish. 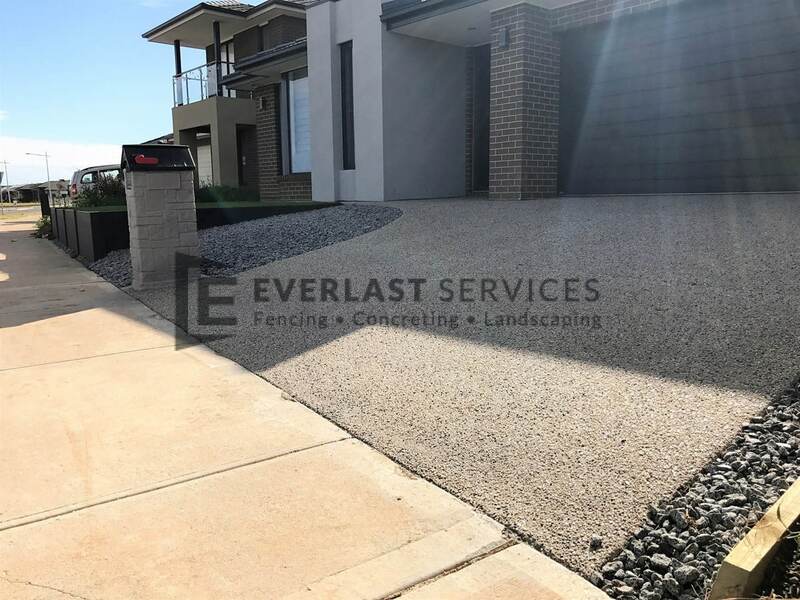 Virtually maintenance free: Aggregate concrete only needs a hose down every now and then and its pebbled, varied aesthetic is perfect for hiding stains. 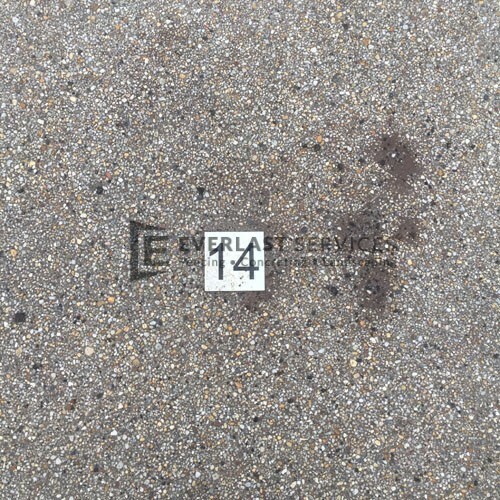 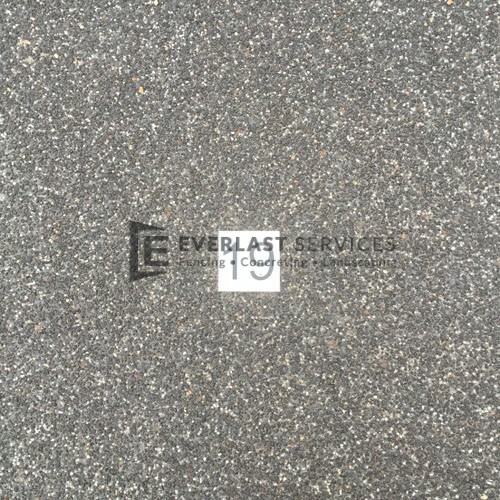 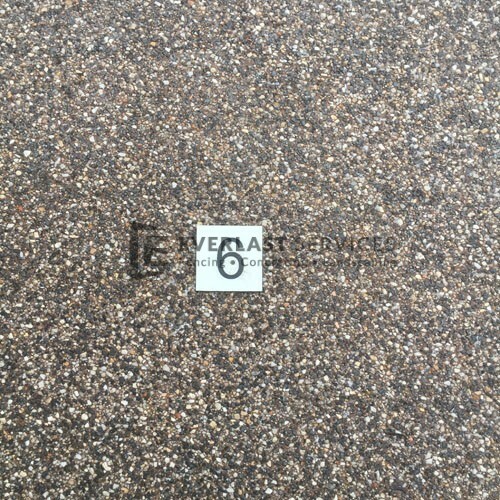 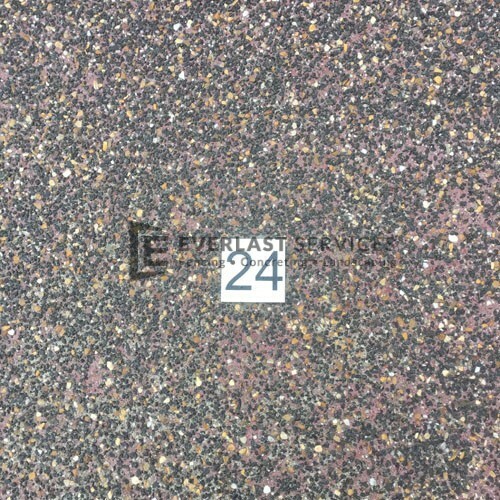 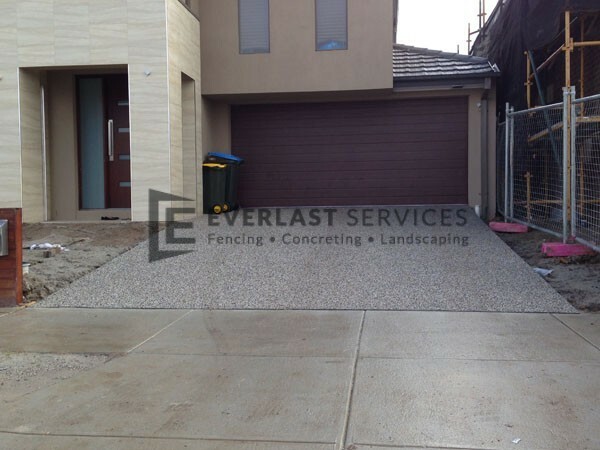 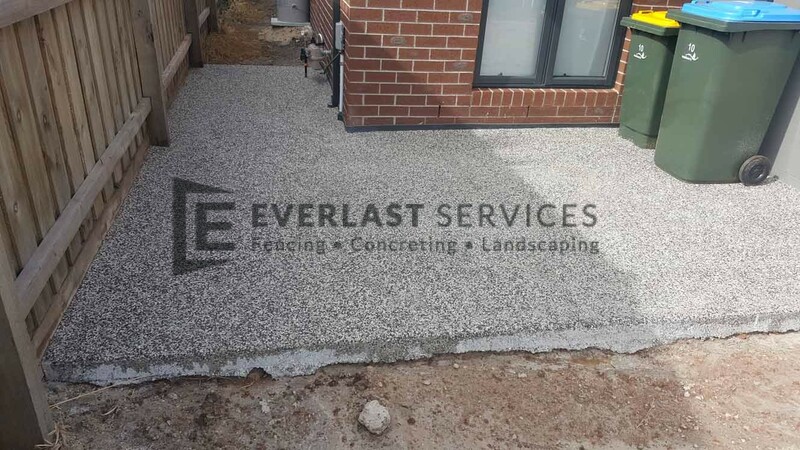 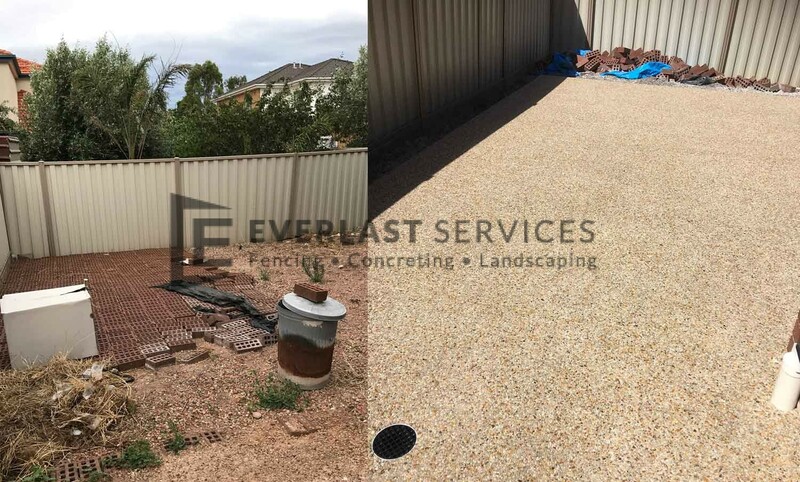 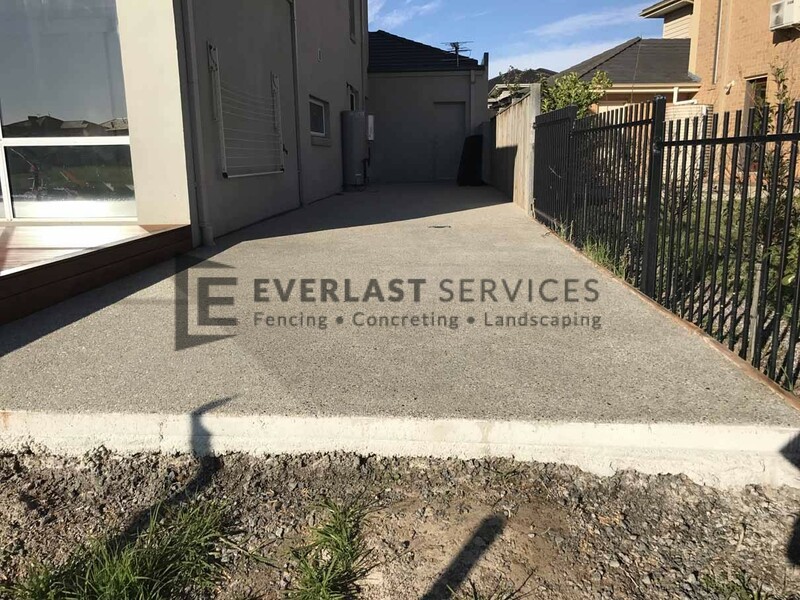 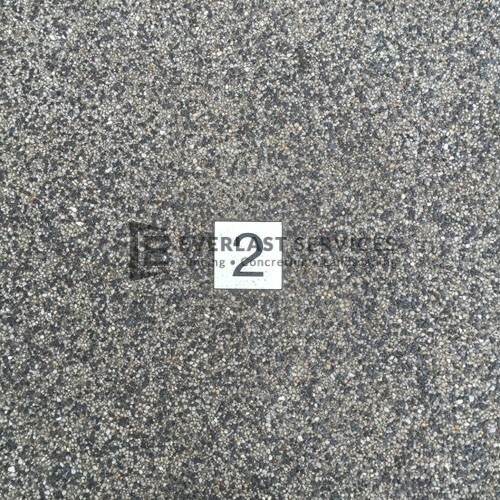 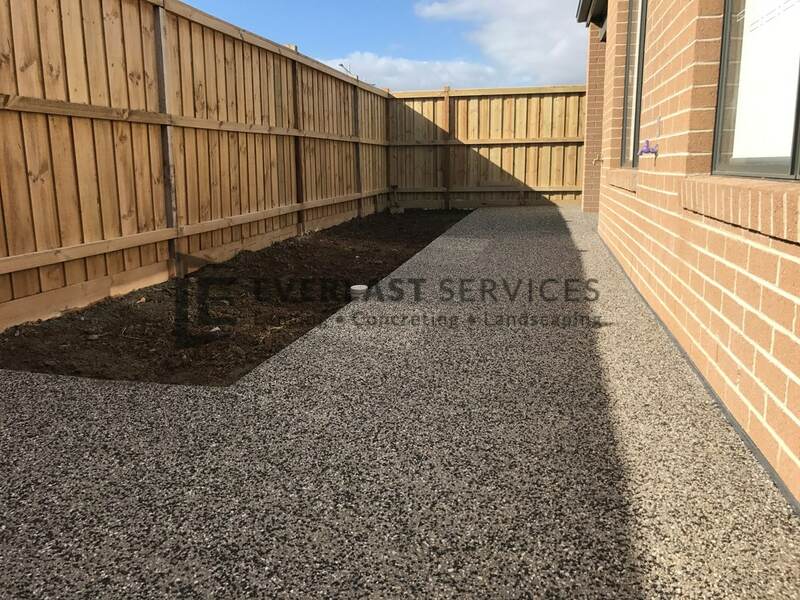 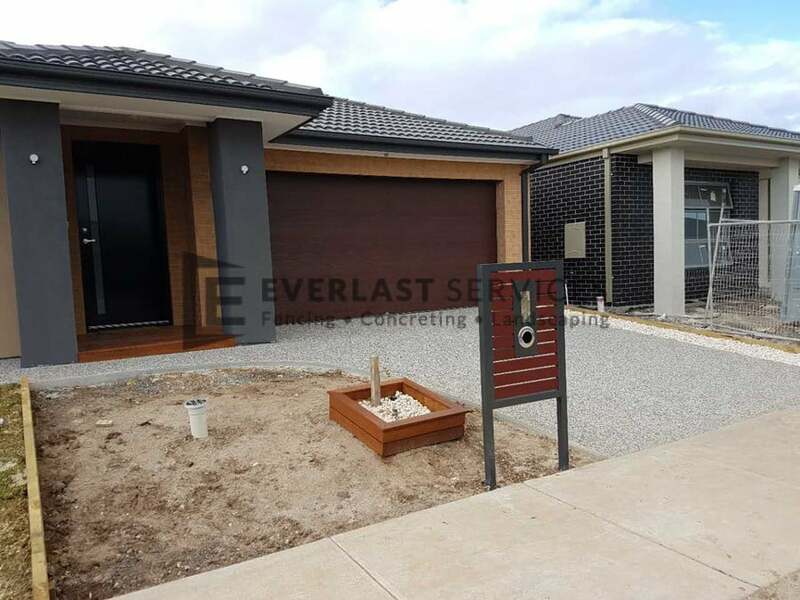 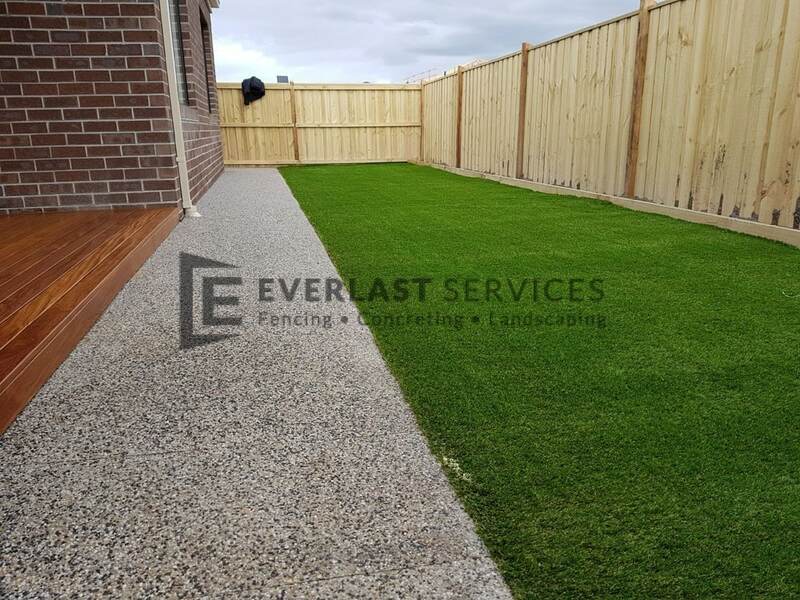 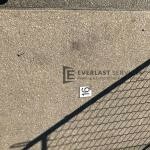 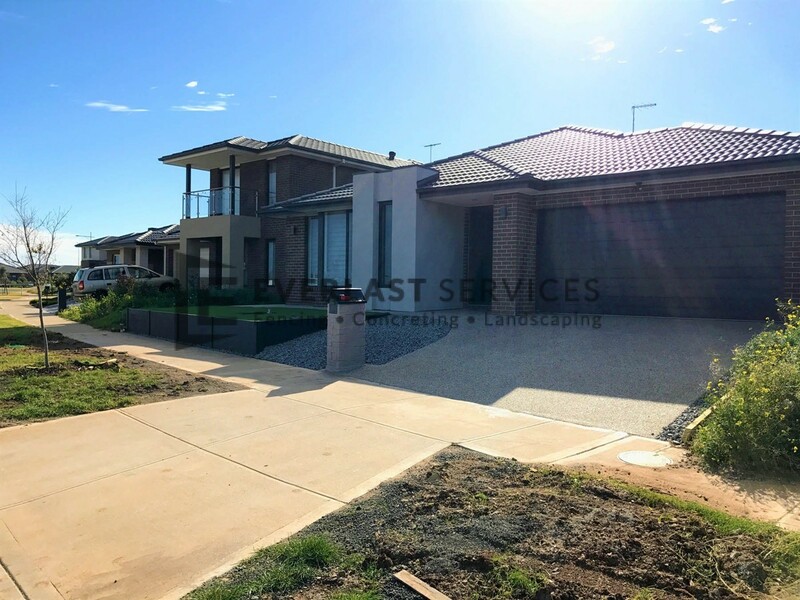 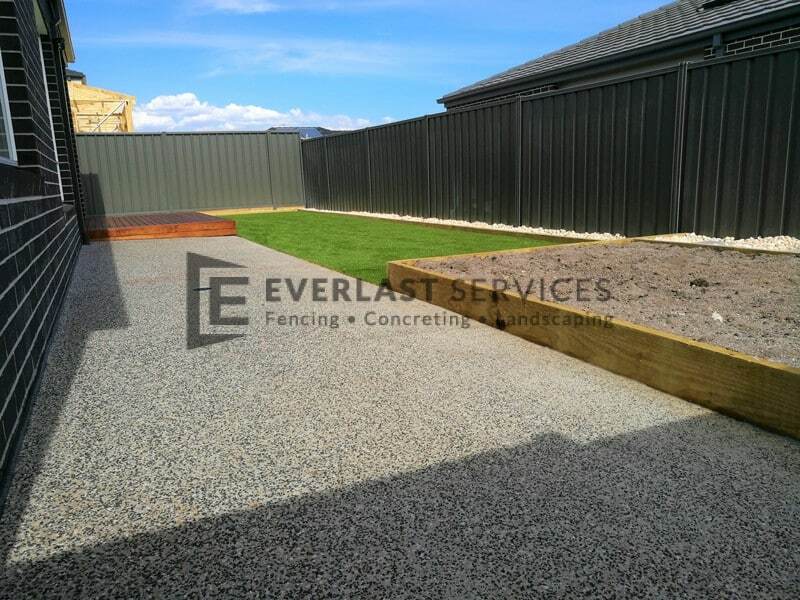 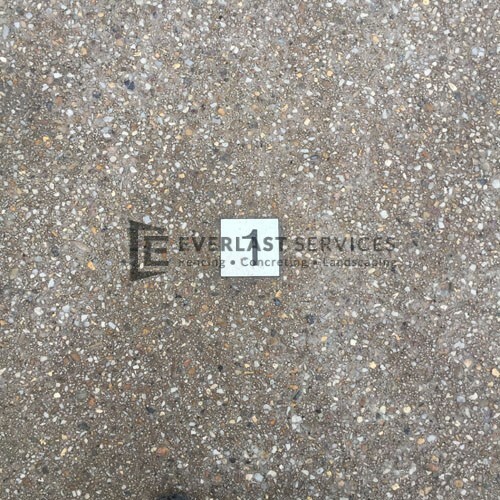 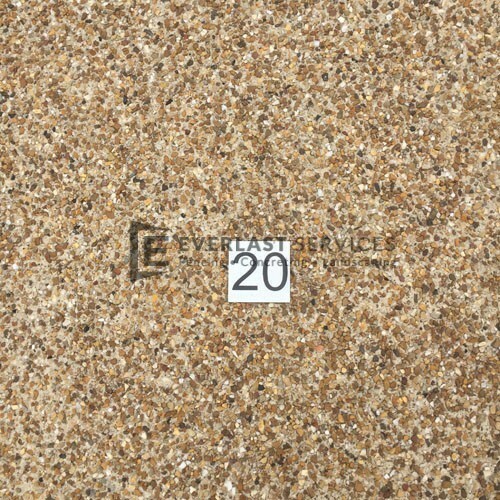 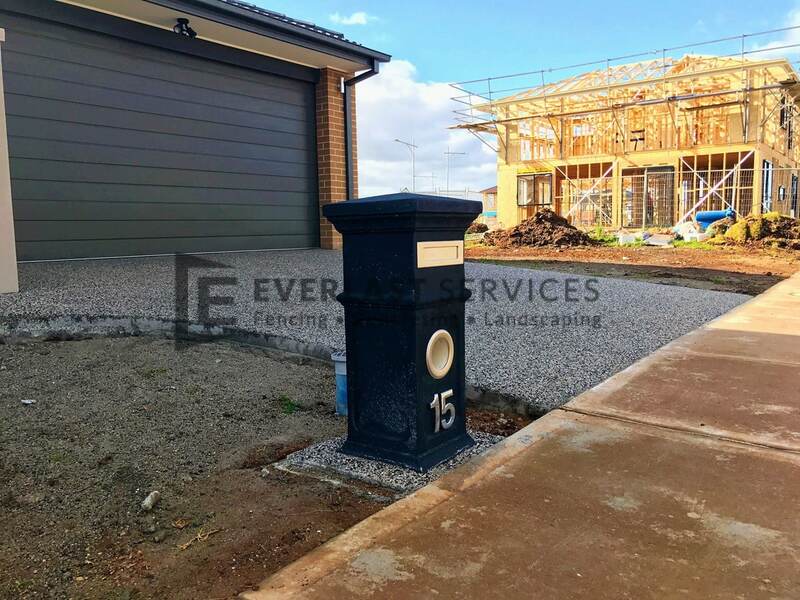 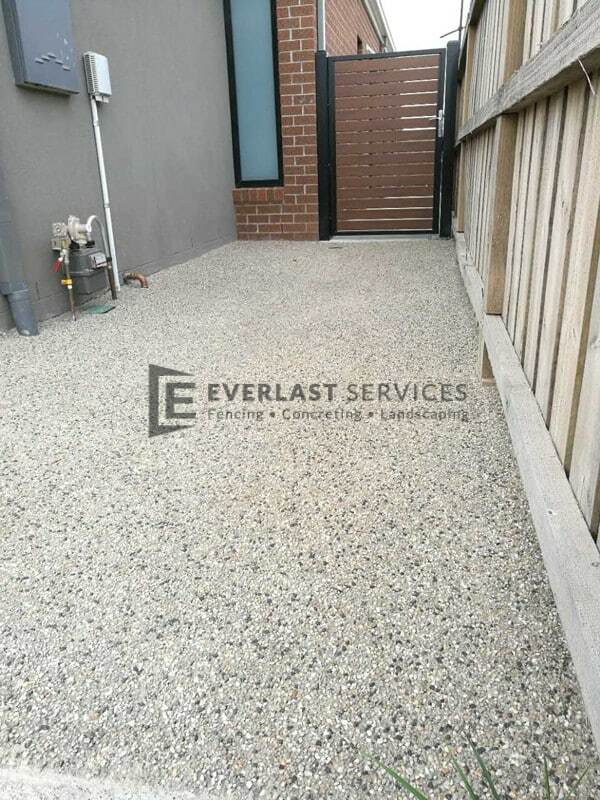 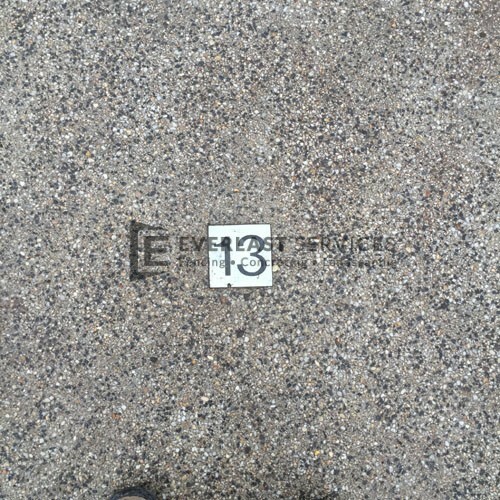 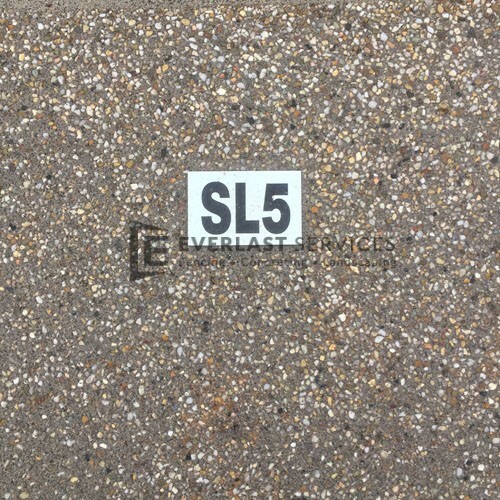 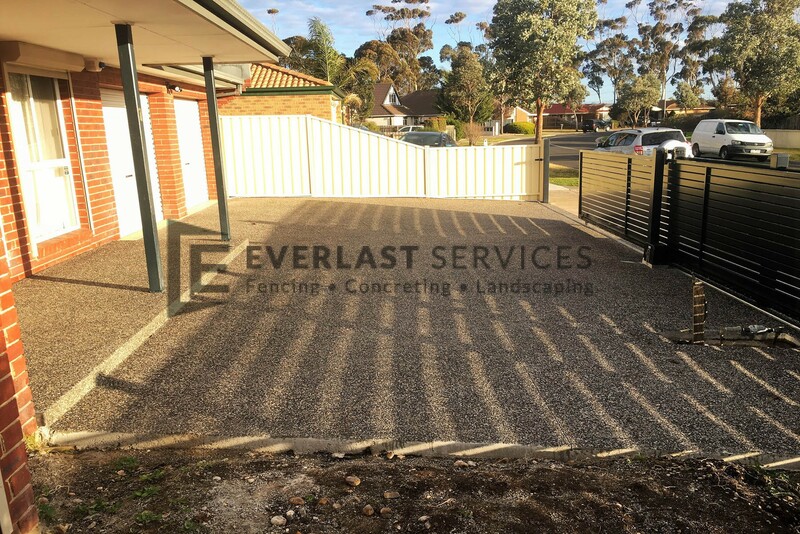 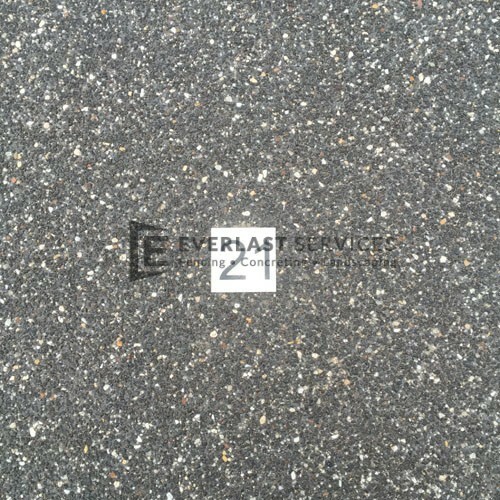 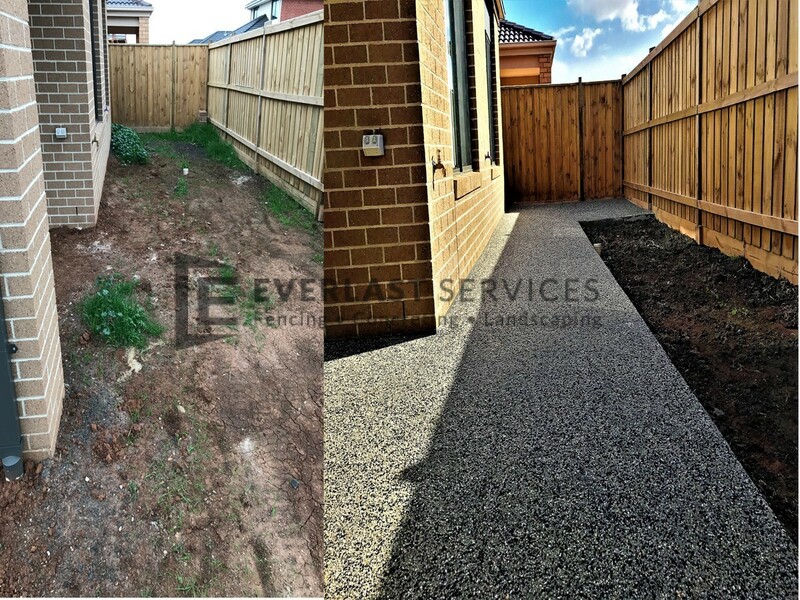 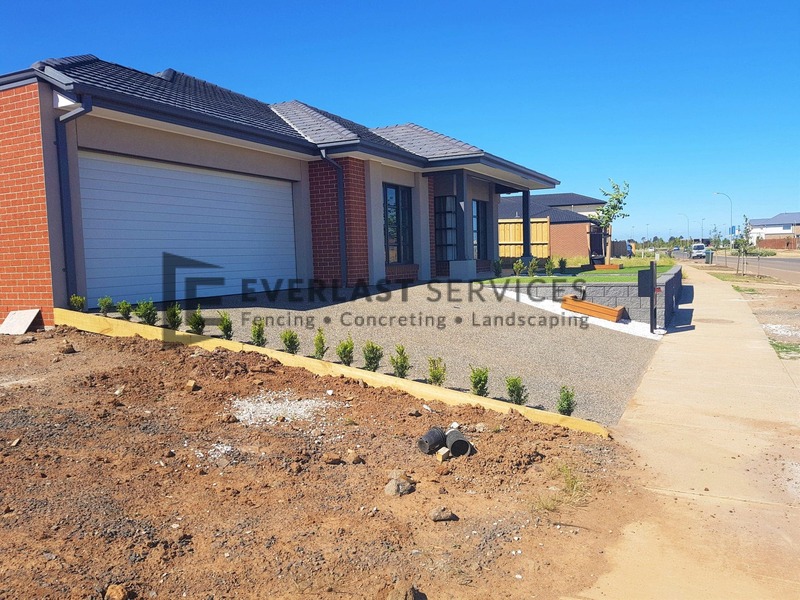 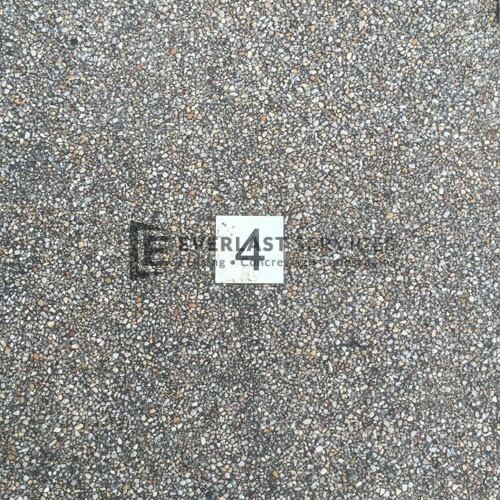 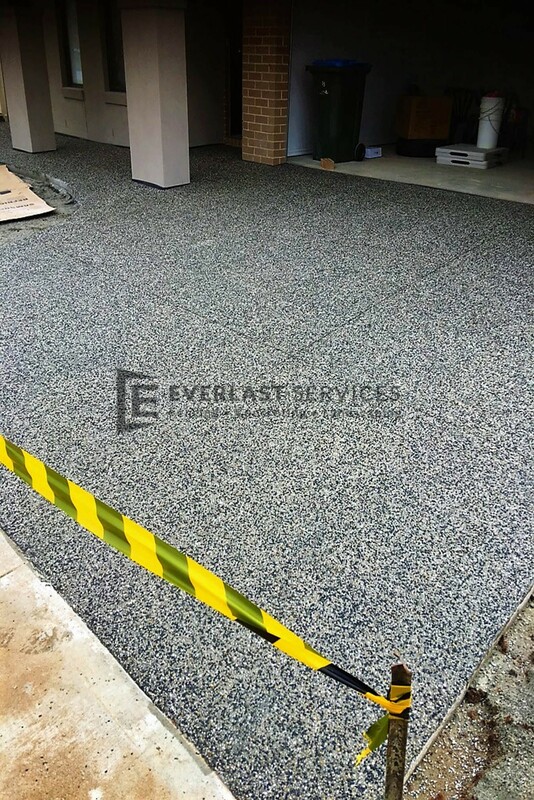 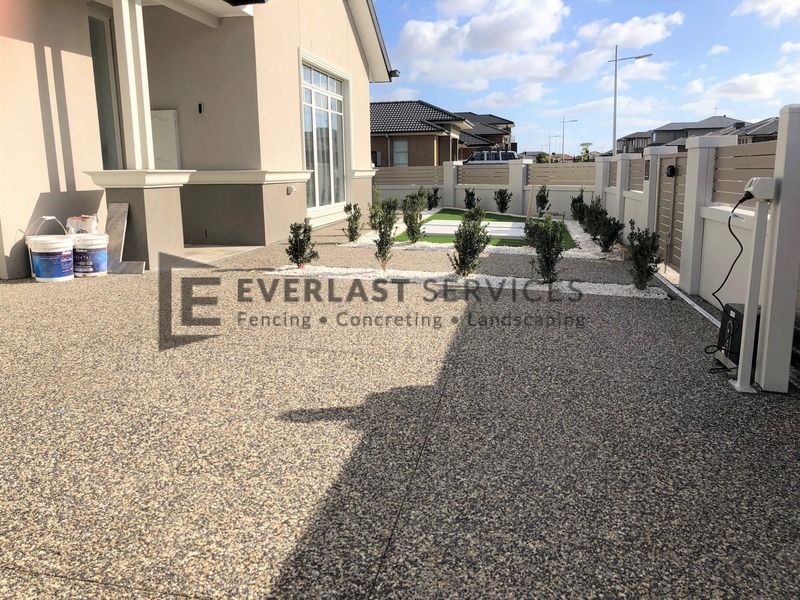 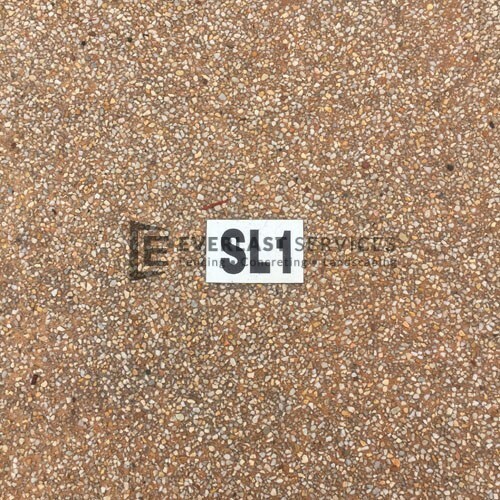 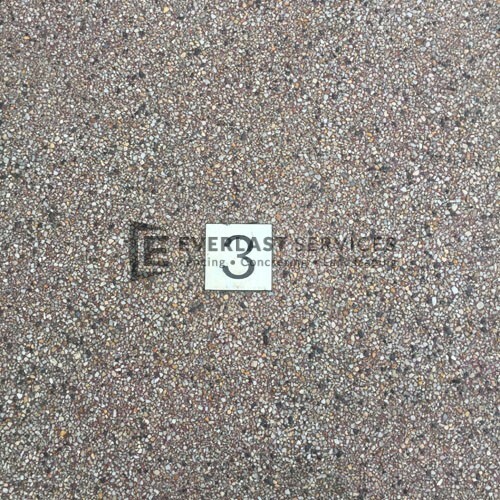 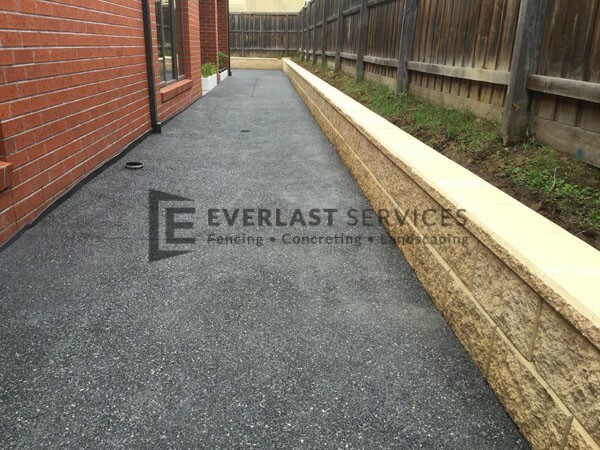 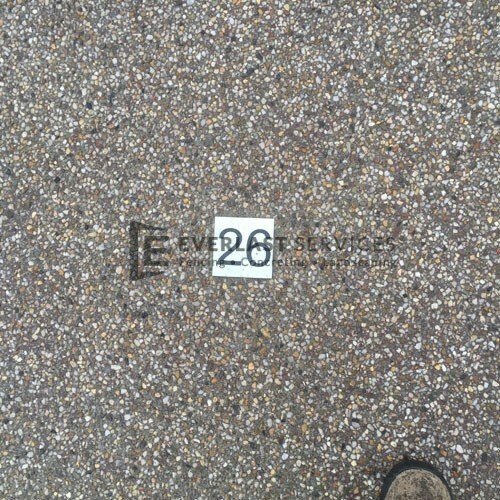 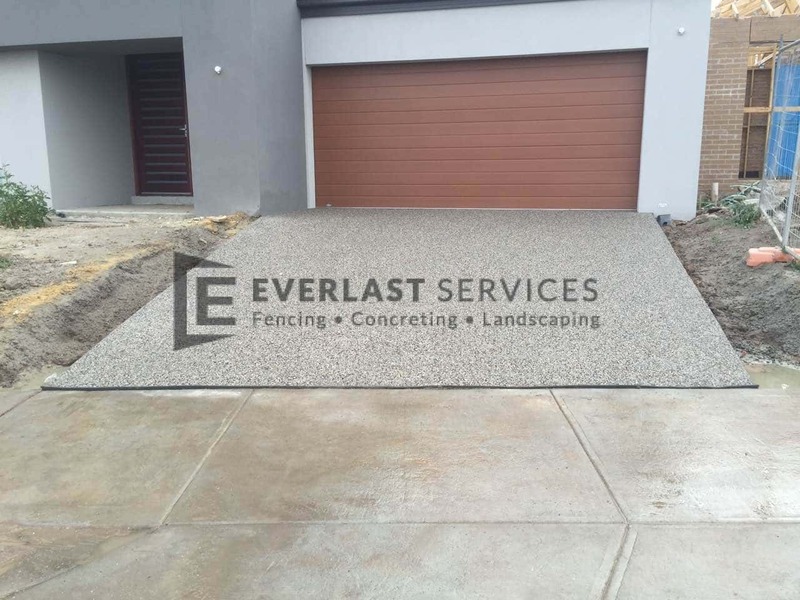 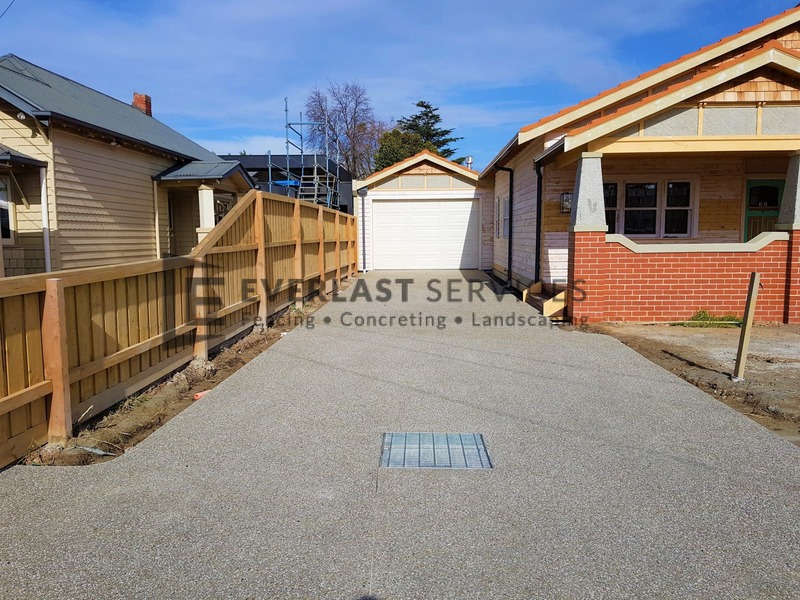 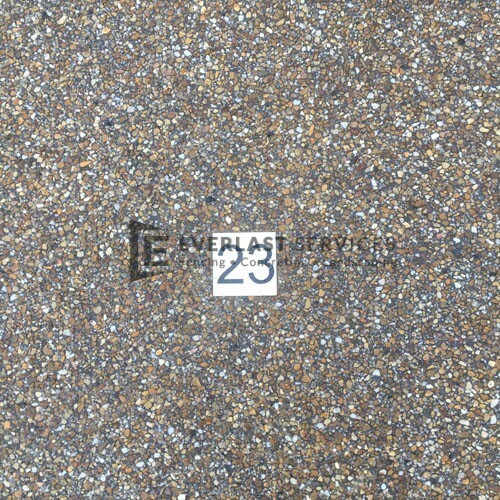 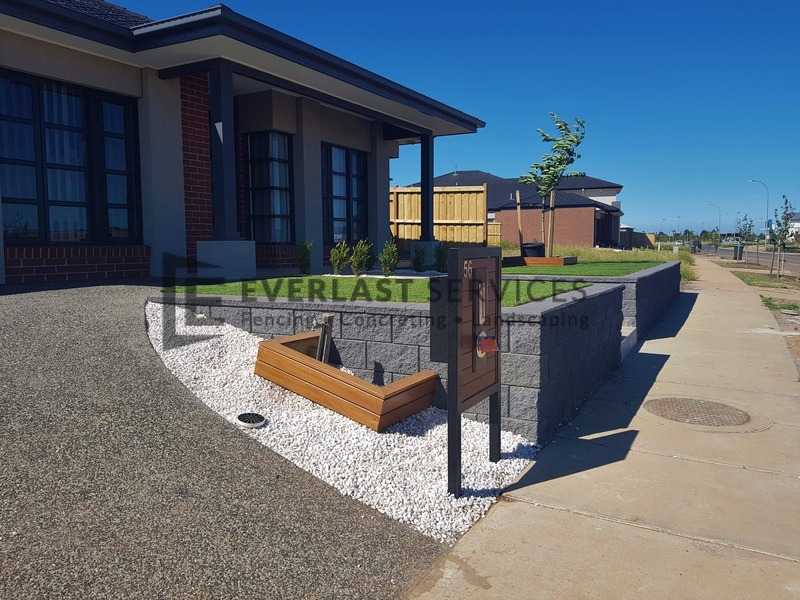 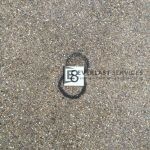 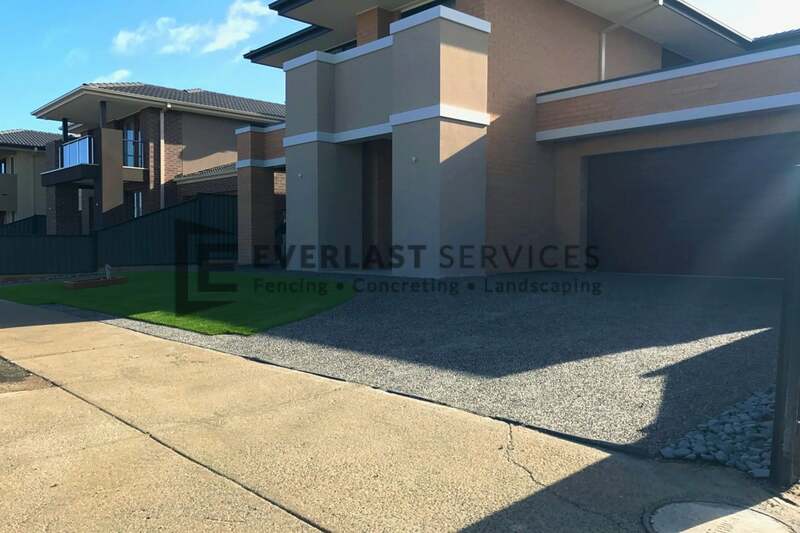 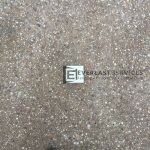 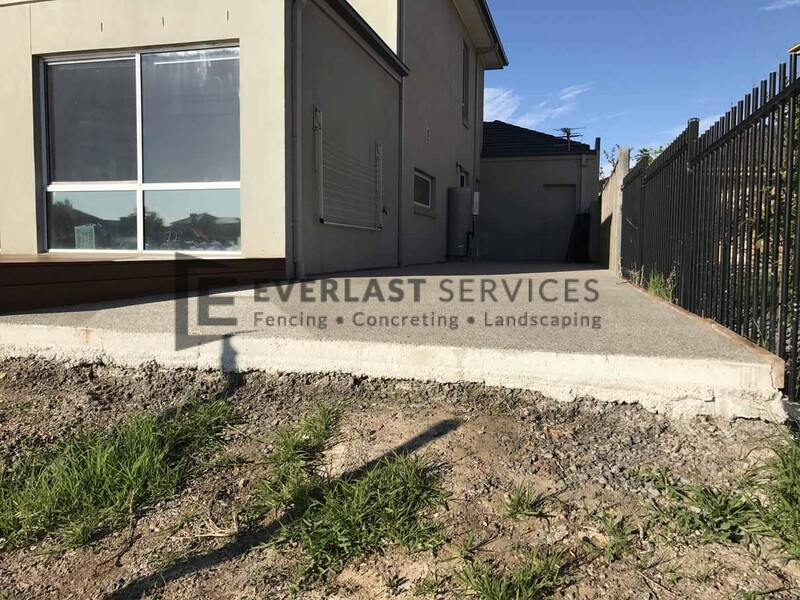 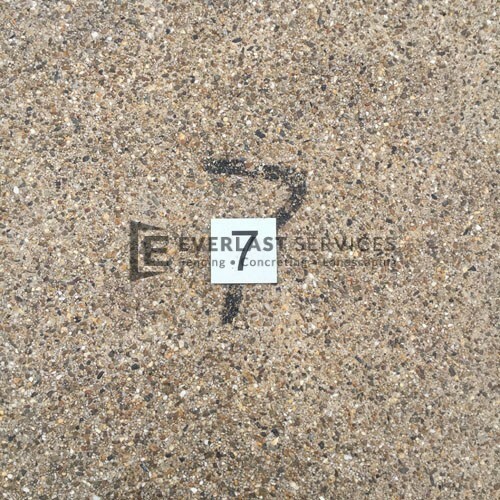 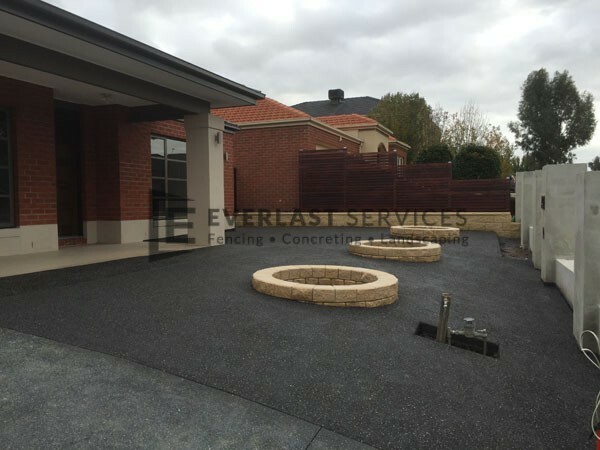 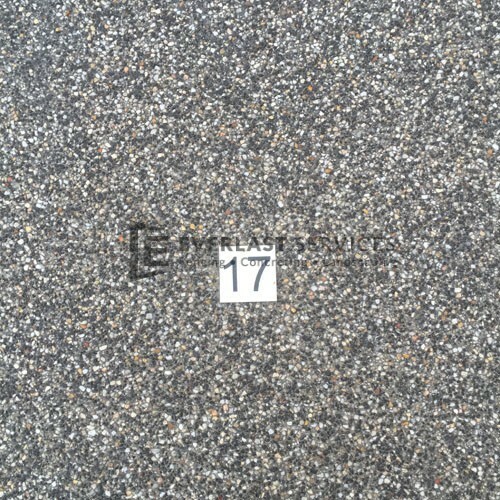 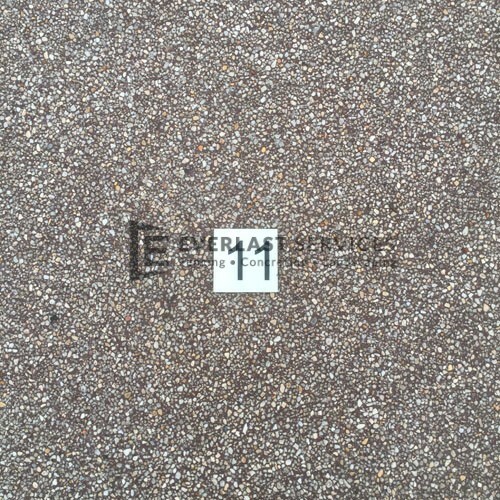 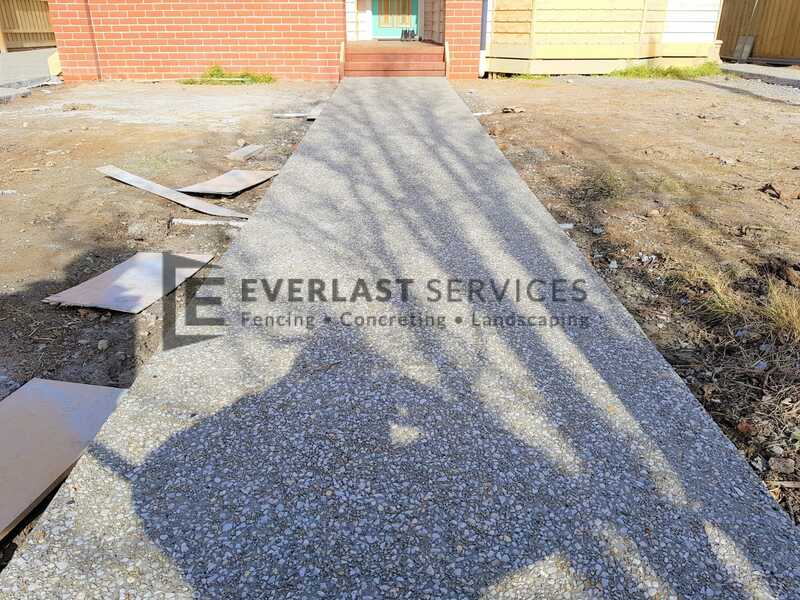 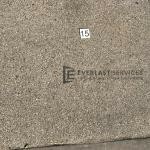 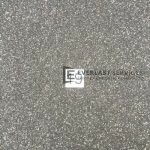 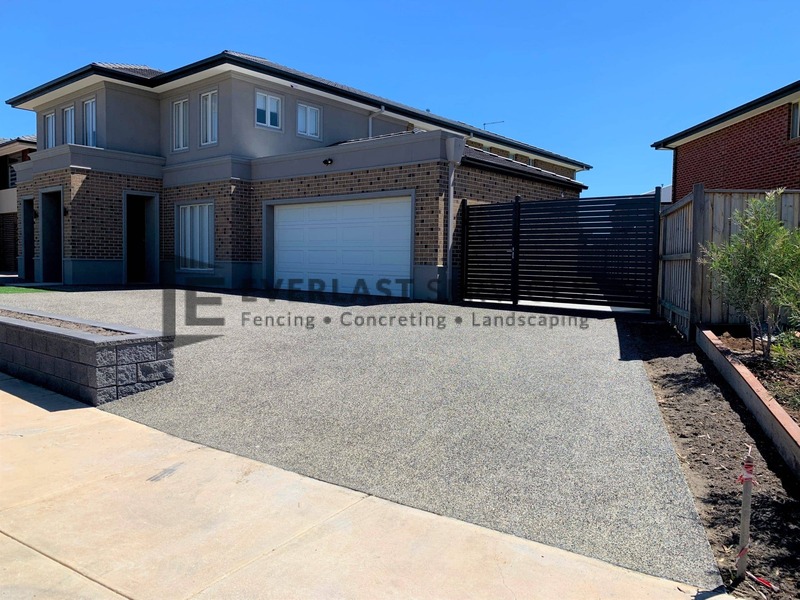 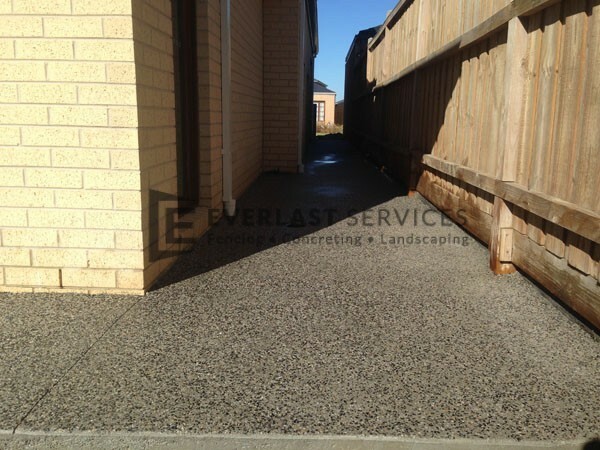 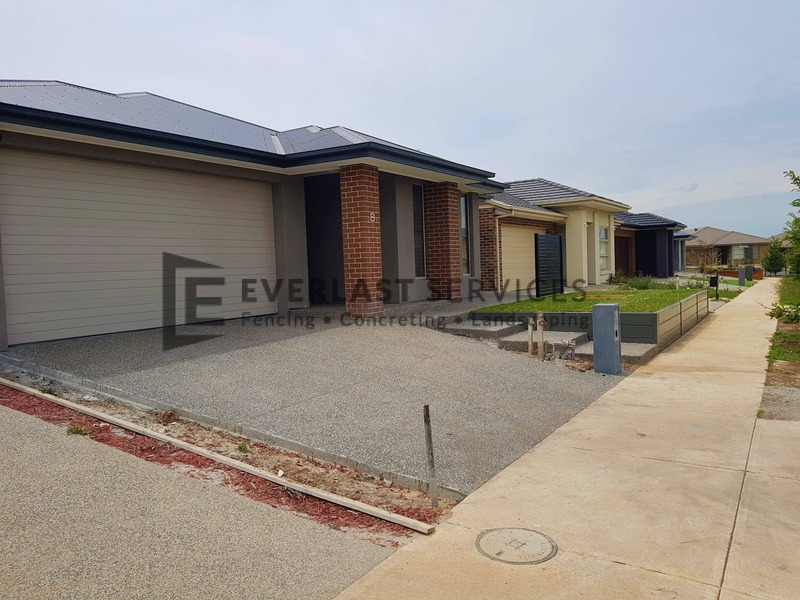 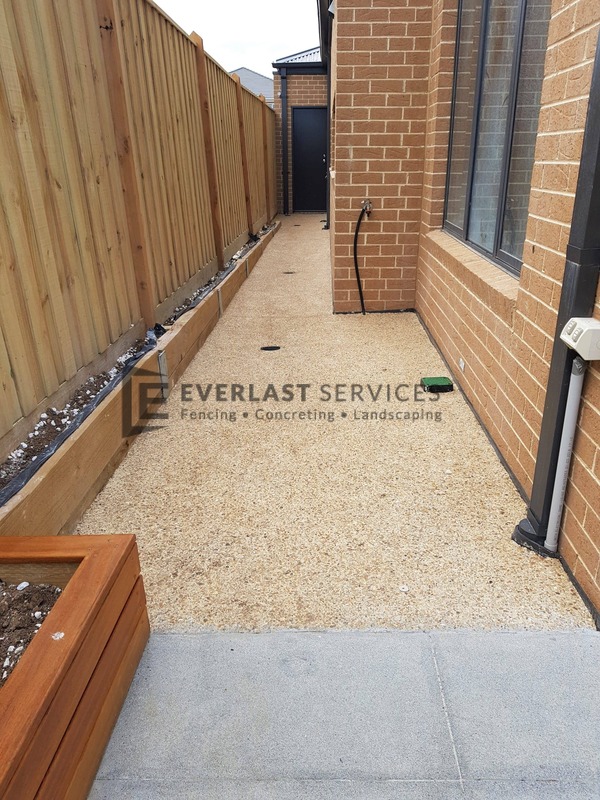 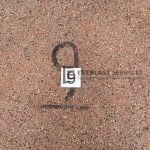 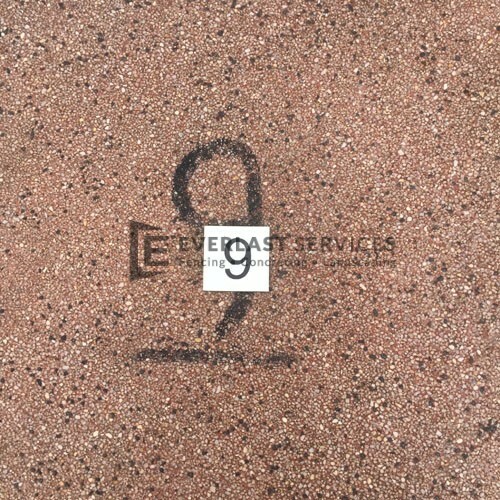 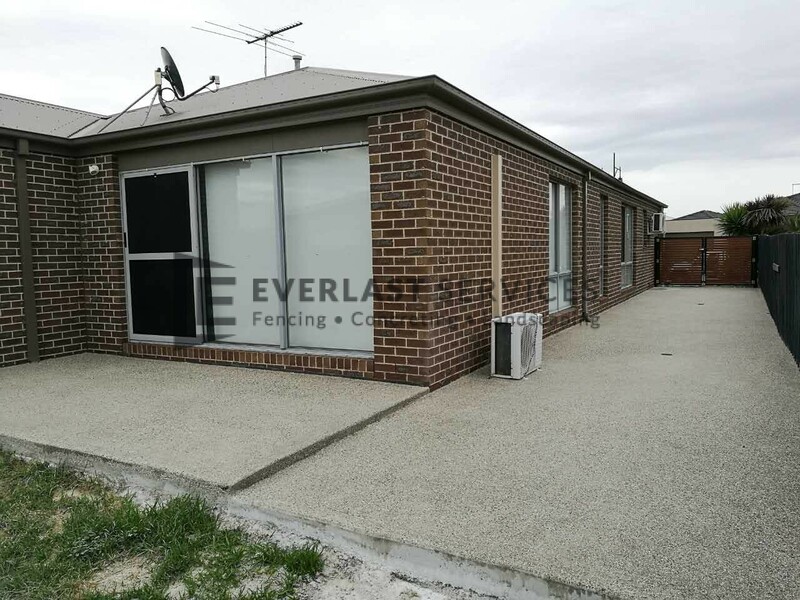 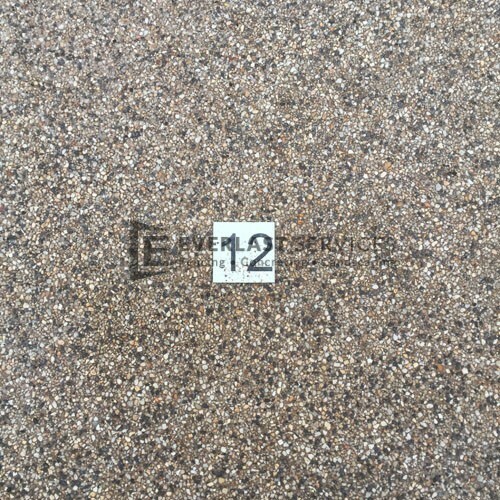 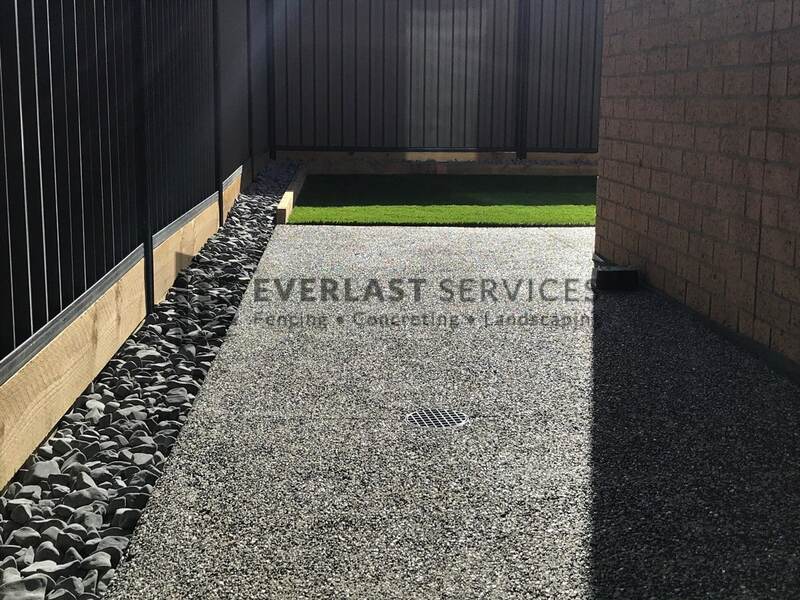 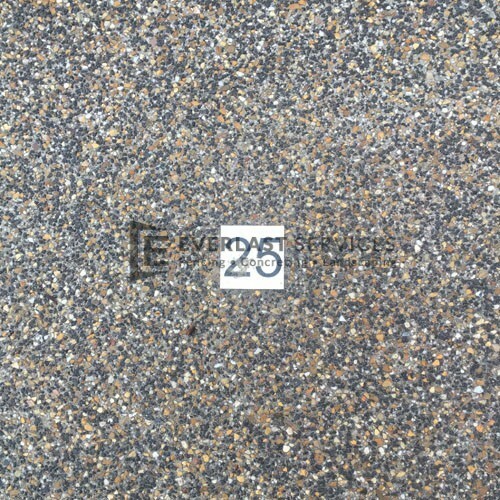 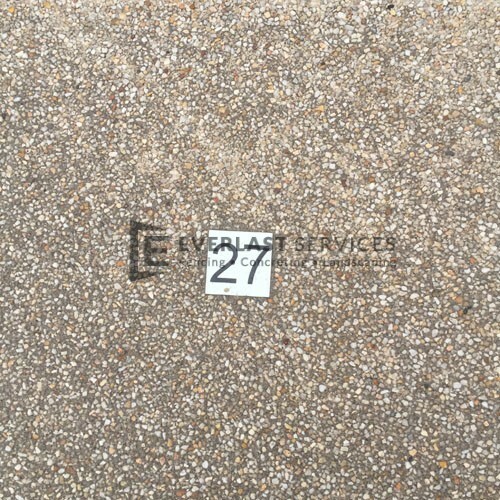 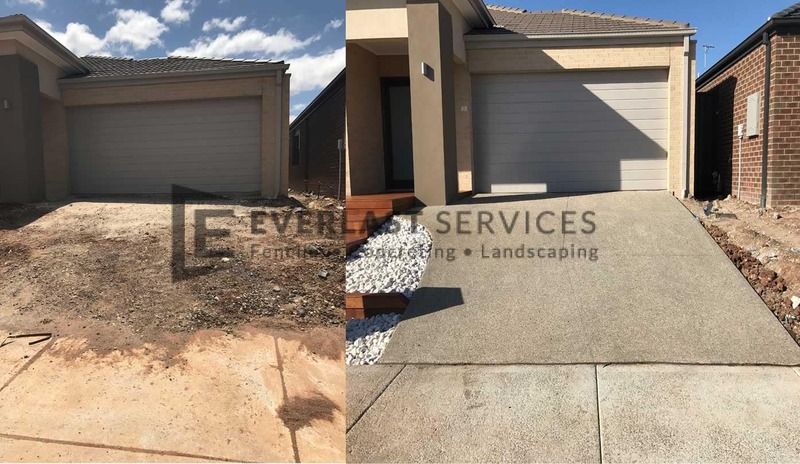 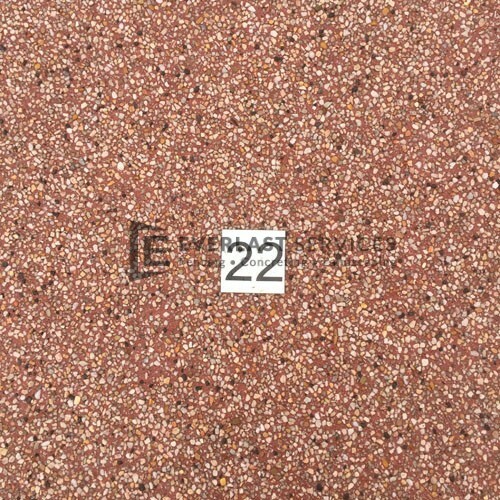 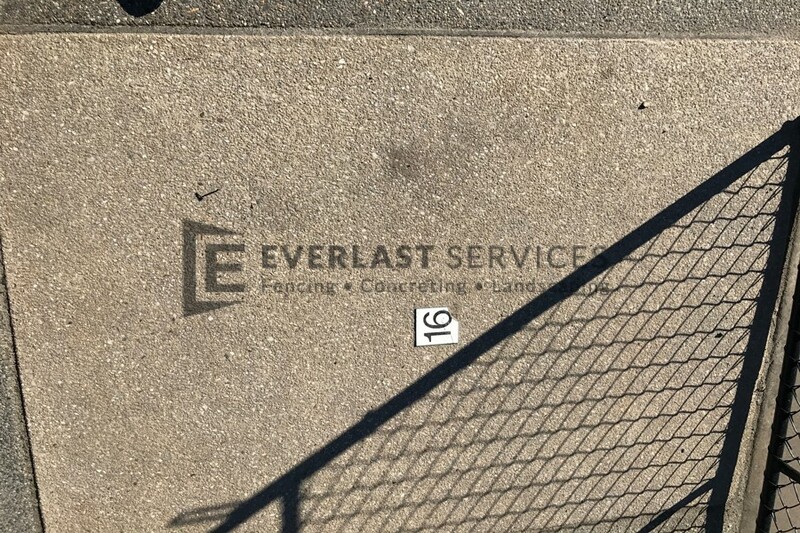 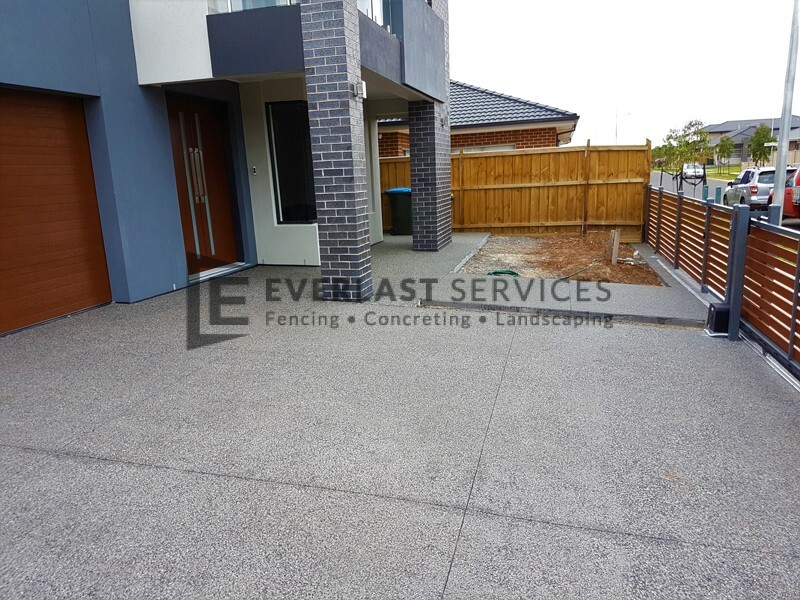 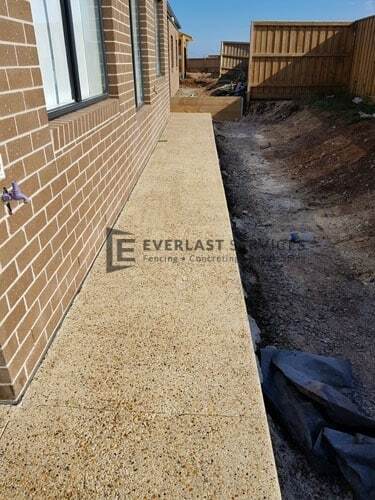 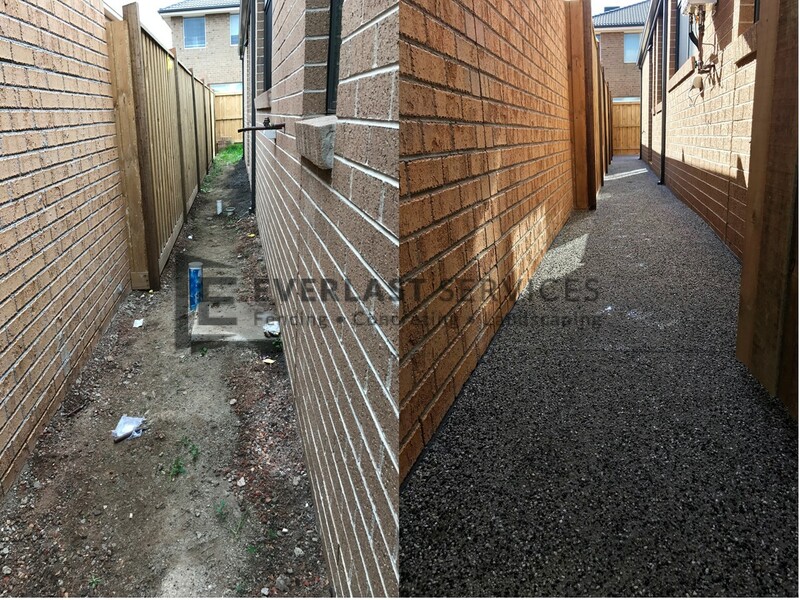 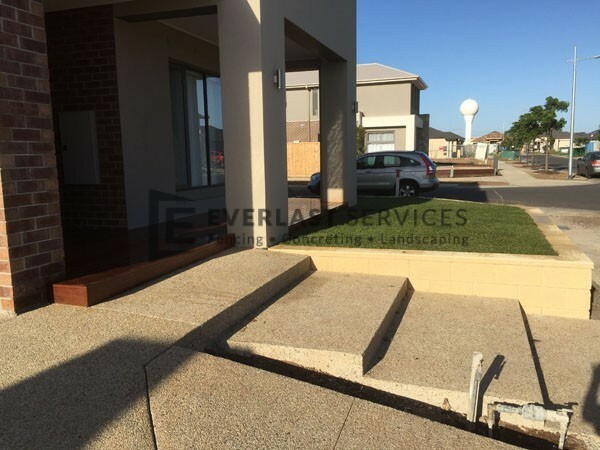 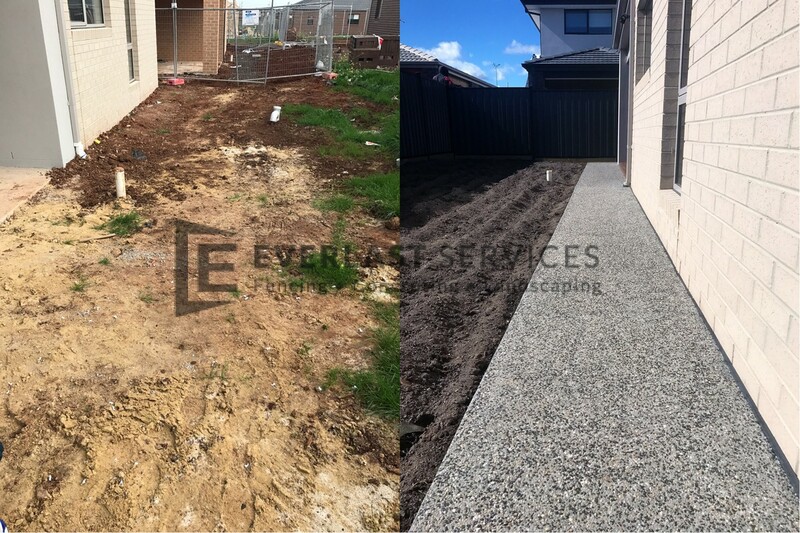 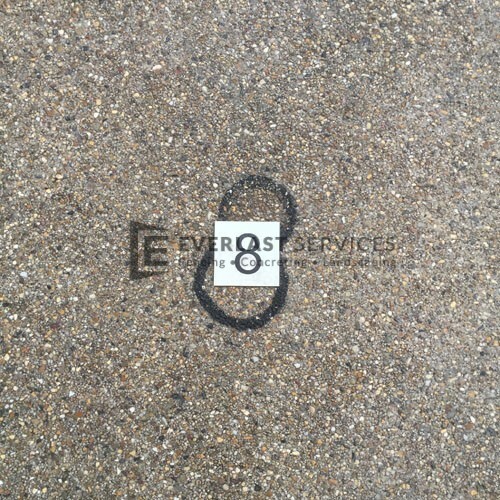 Everlast Services has been providing concrete solutions for over 20 years. 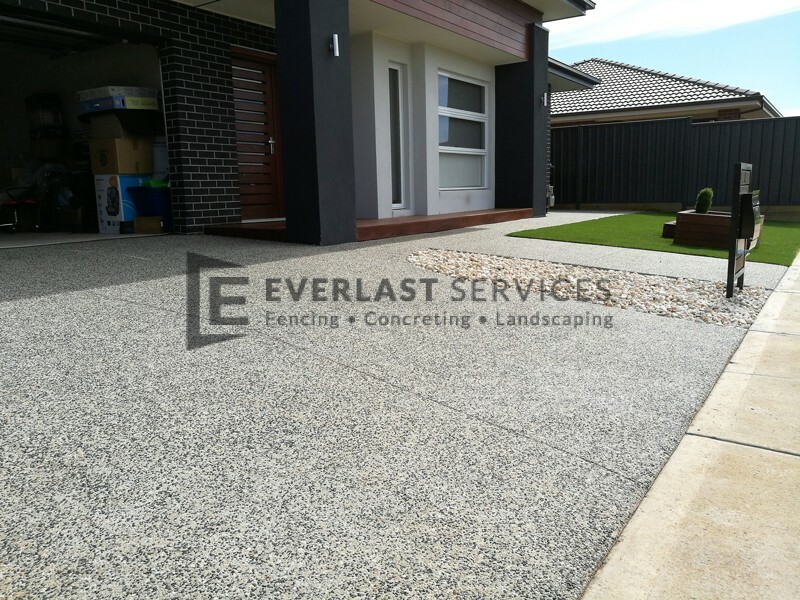 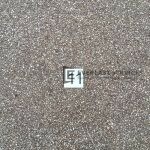 As such, we know that special attention needs to be placed on choosing the right type of concrete for a driveway. 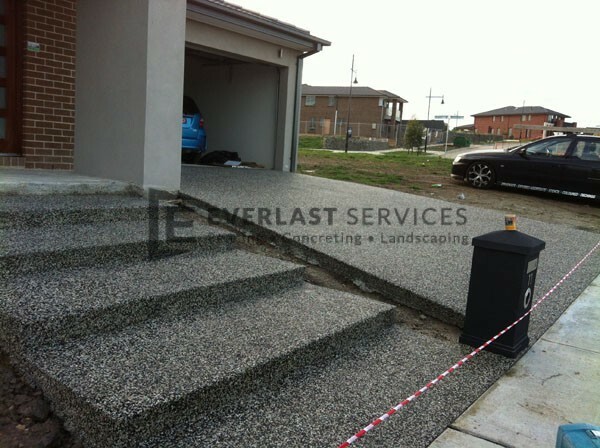 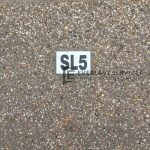 Driveways are a high-traffic area and need to be constructed in a way that will stand up to the repeated load of cars. 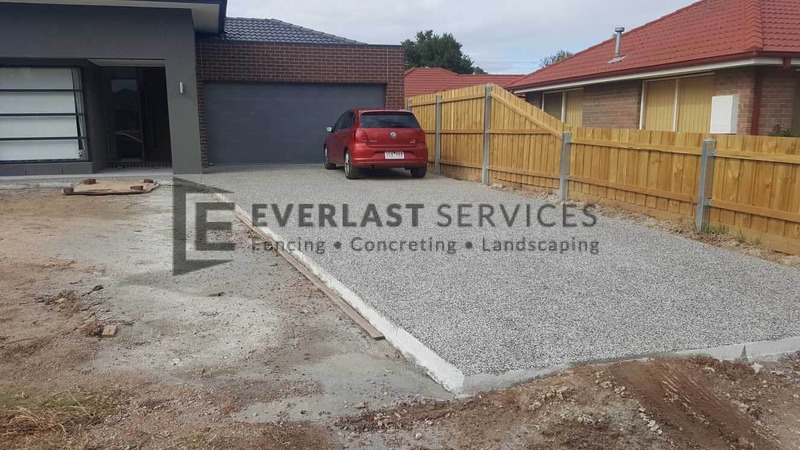 A driveway that carries normal sized cars should be at least 10cm thick, but if you have heavier vehicles the concrete needs to be up to 13cm thick. 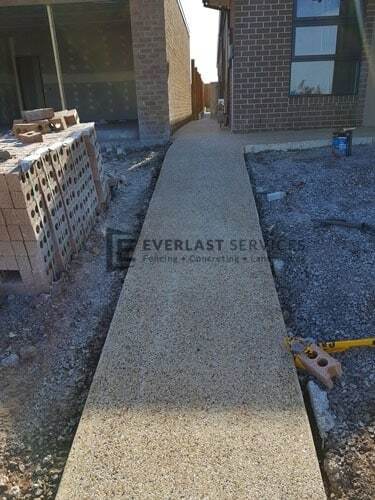 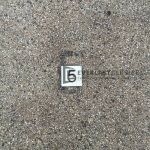 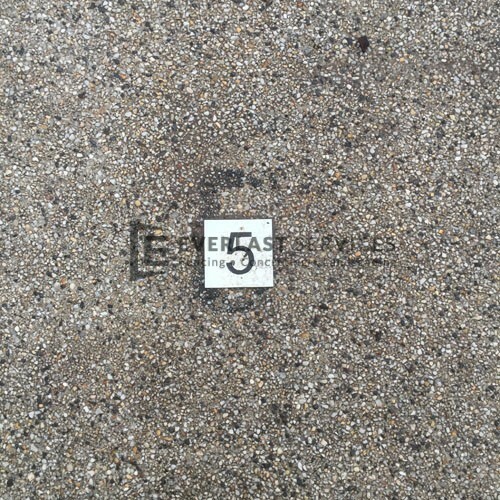 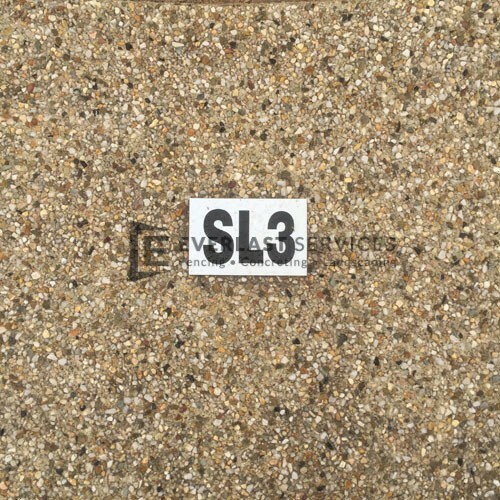 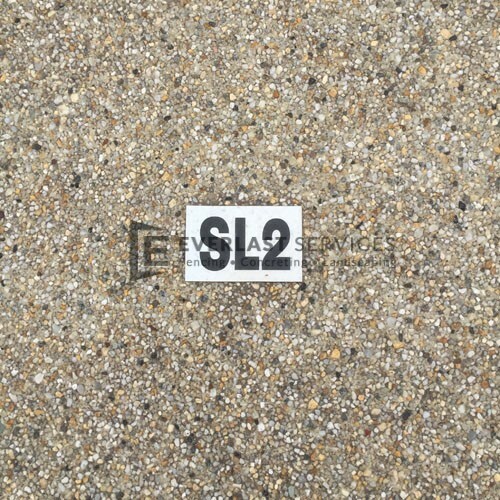 Concrete driveways need to have strength of 4000 pounds per square inch (PSI). 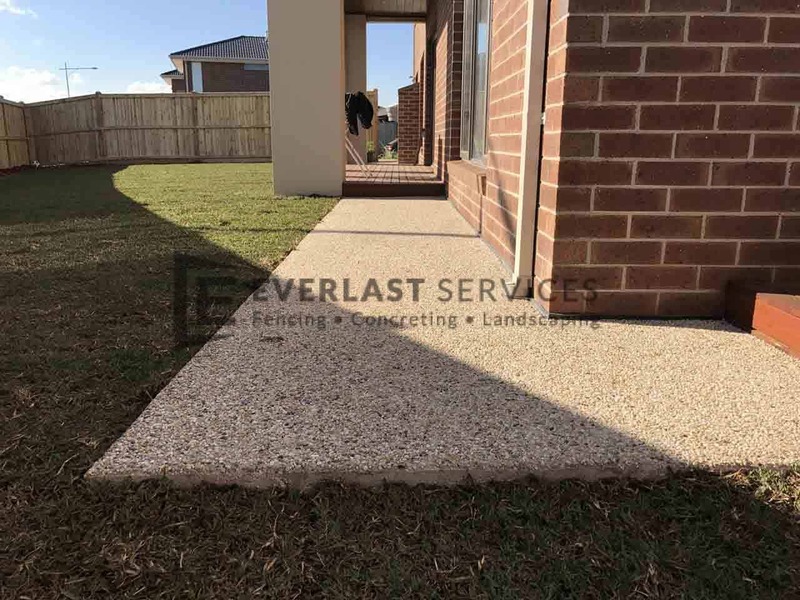 What Types of Concrete Can Be Used? 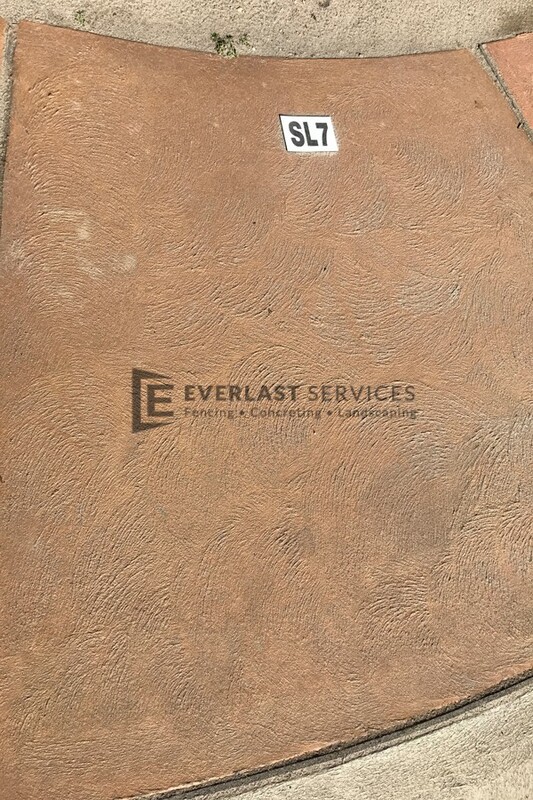 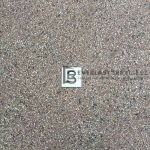 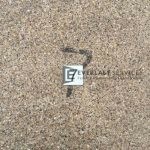 Stamped Concrete: stamped concrete allows you to achieve the look of brick, slate, stone, tile or wood without having to foot the expensive bill that these materials carry. 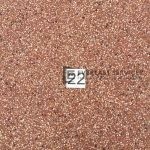 Stamped concrete uses patterns and textures to resemble these materials while being longer-lasting and easier to maintain. 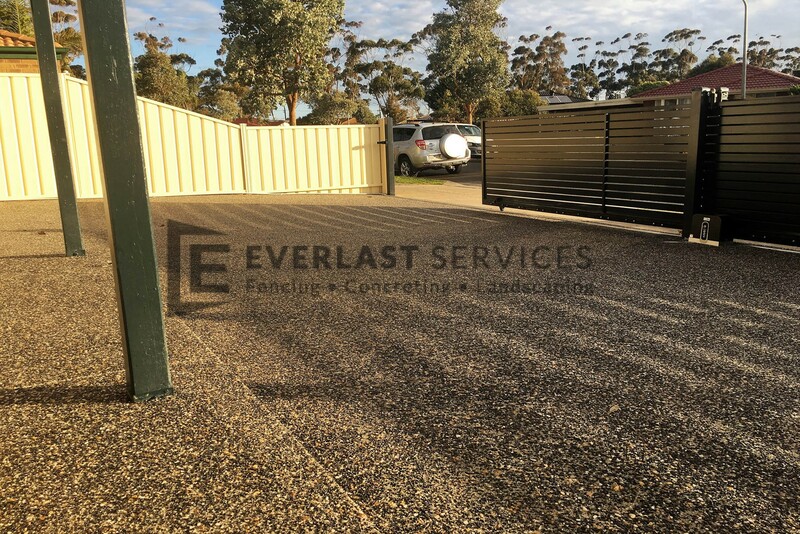 Exposed Aggregate Concrete: exposed aggregate gives you all the strength, durability and ease of maintenance that concrete gives while adding a textural element by exposing the aggregate. 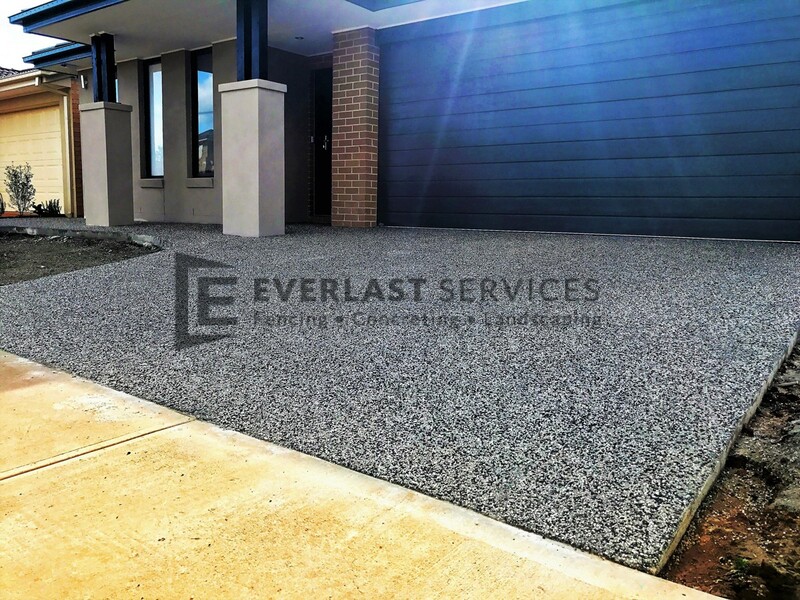 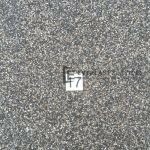 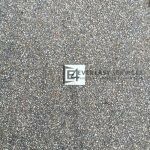 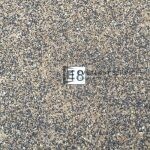 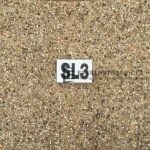 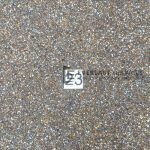 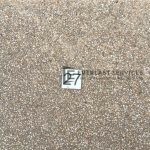 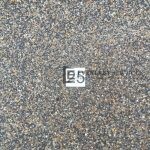 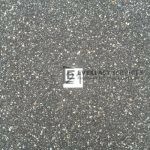 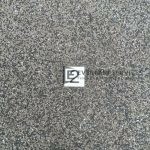 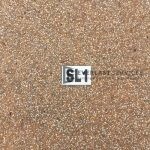 This is a very popular option for driveways as it has the added benefit of hiding stains due to its pebbled aesthetic and looks incredible. 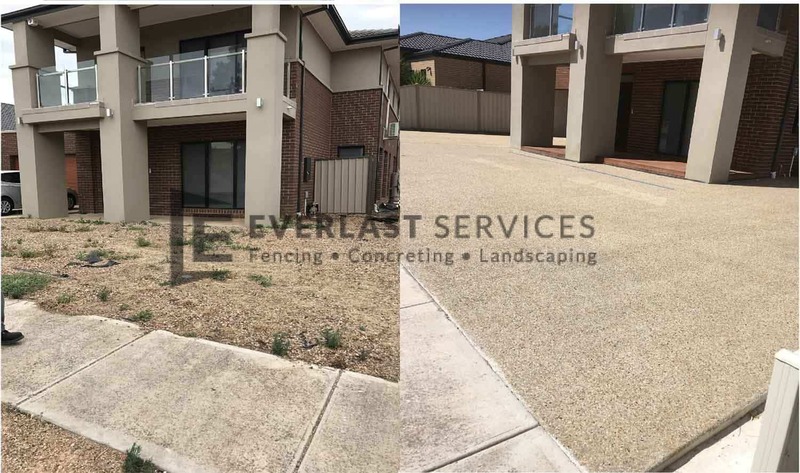 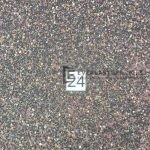 Rocksalt Finish: rocksalt finish refers to the laying of concrete that has pits and holes in the surface in order to create a marbled or course finish. 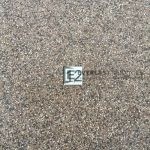 It is perfect for giving the appearance of marble, while being far cheaper and easier to clean. 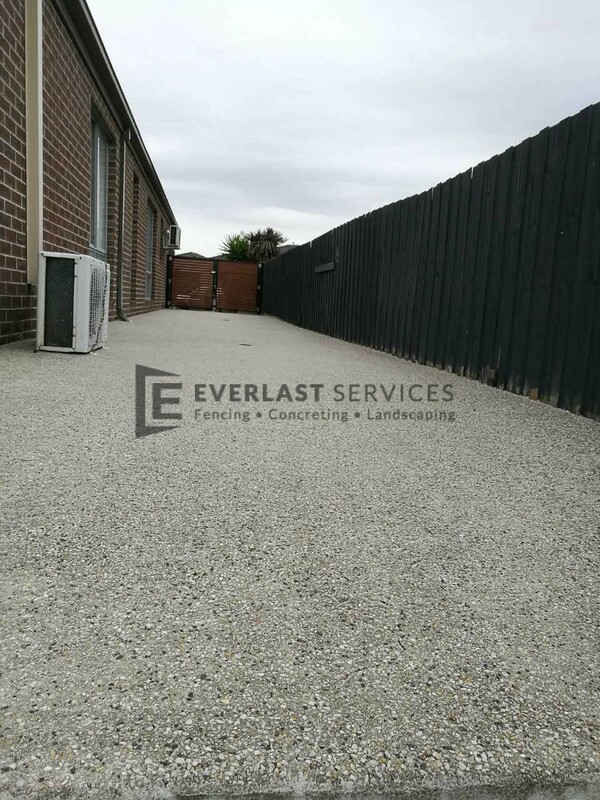 Rolled Concrete: rolled concrete is a cheaper form of traditional concrete and uses the same mixture but with different ratios of each ingredient. 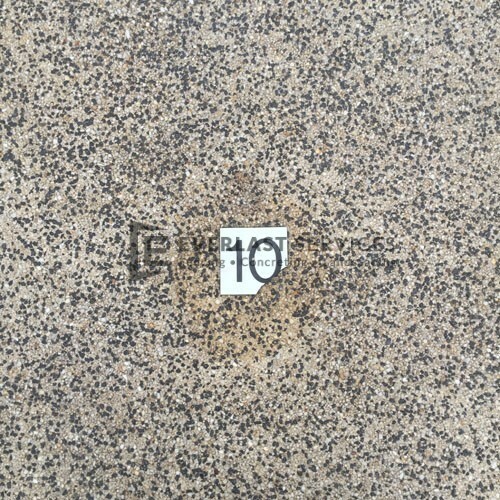 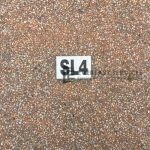 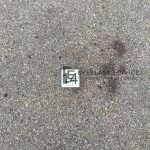 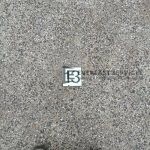 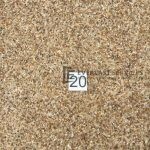 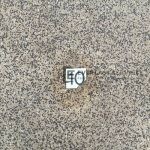 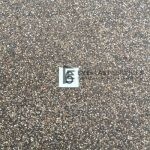 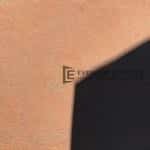 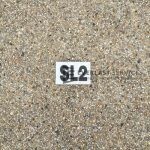 Stenciled Concrete: stenciled concrete uses stencils and concrete paint to create patterns, designs or images in concrete. 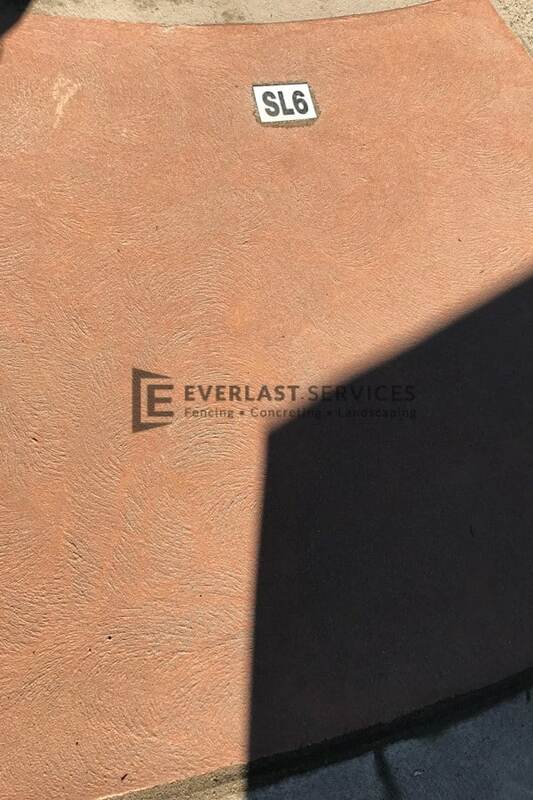 It can be used in conjunction with other types of finishes, such as rocksalt finish, to create a truly unique look. 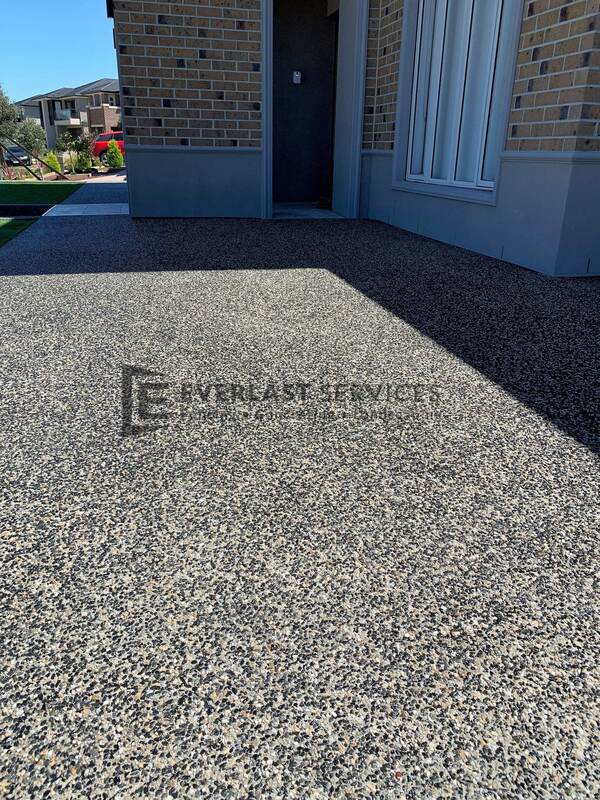 You need an expert in order to get the perfect exposed aggregate concrete pour. 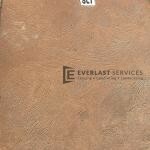 With 20 years in the industry, you can rest assured that you’ll get the perfect pour on time, every time. 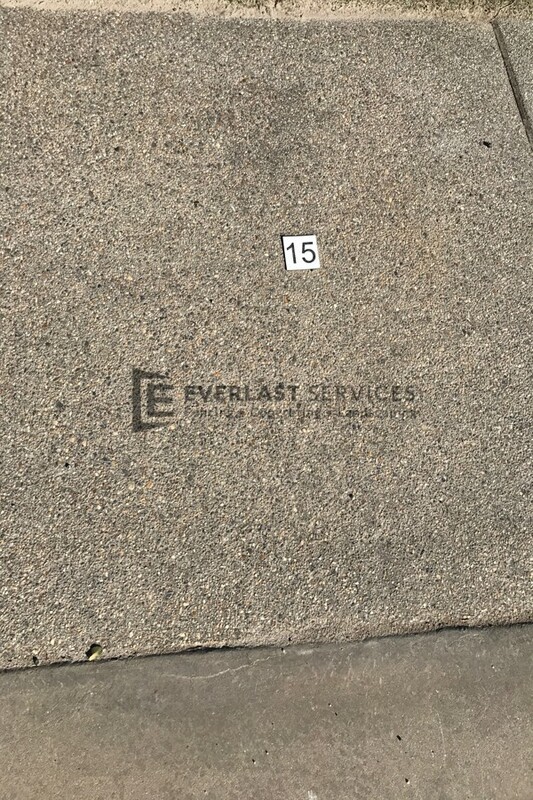 We pride ourselves on effective communication. 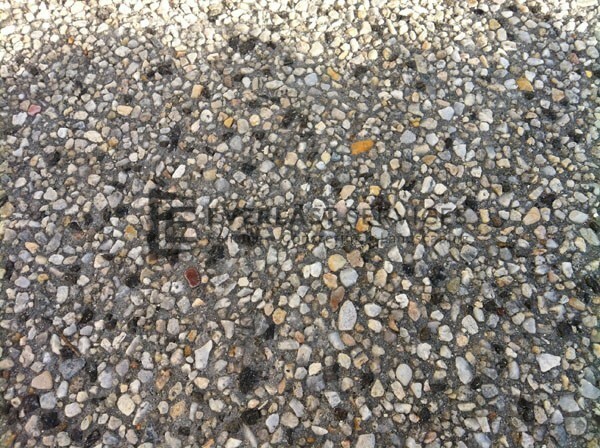 You’ll be in charge at every point during the job and nothing goes ahead without your permission. 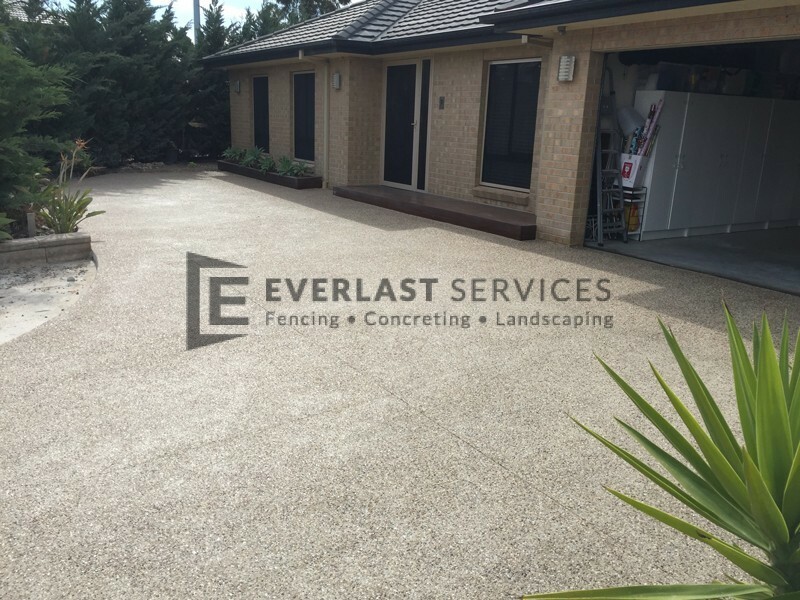 We love delivering the perfect job and we love doing it for a fair price. 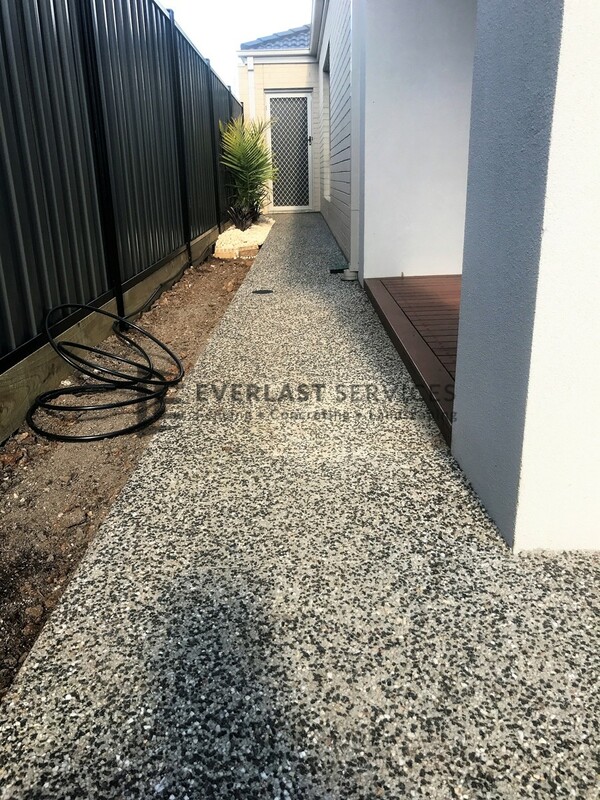 We promise to keep your exposed aggregate concrete cost as low as possible. 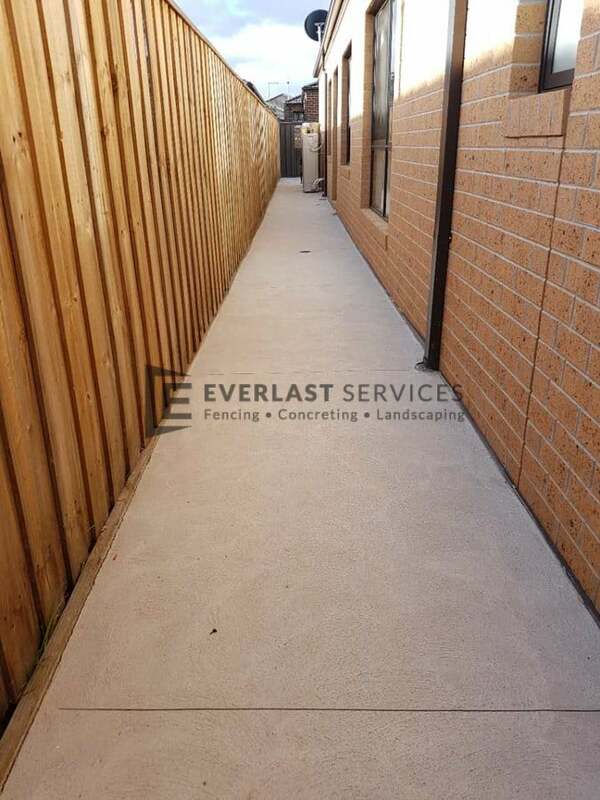 We’re experienced in all types of concreting, so there’s no job we can’t handle. 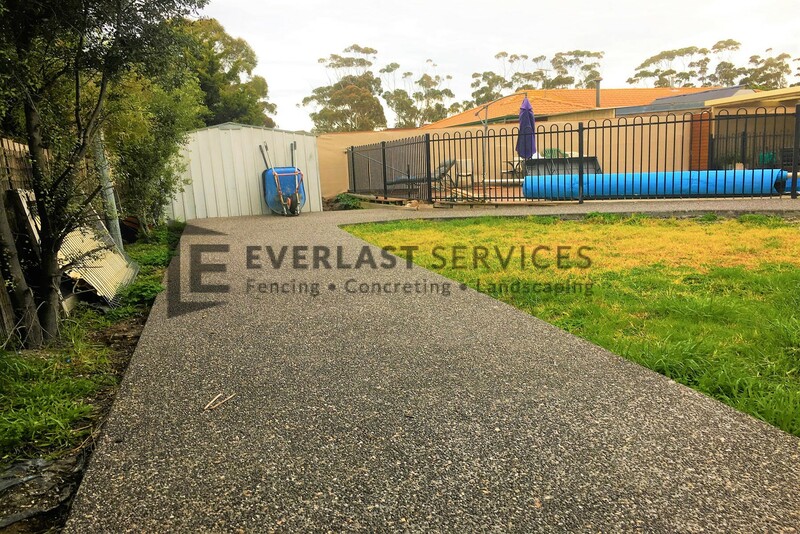 We can do the driveway, the path, the patio and the pool area, all with the same commitment to absolute quality and respect to you, the customer.